How time flies! 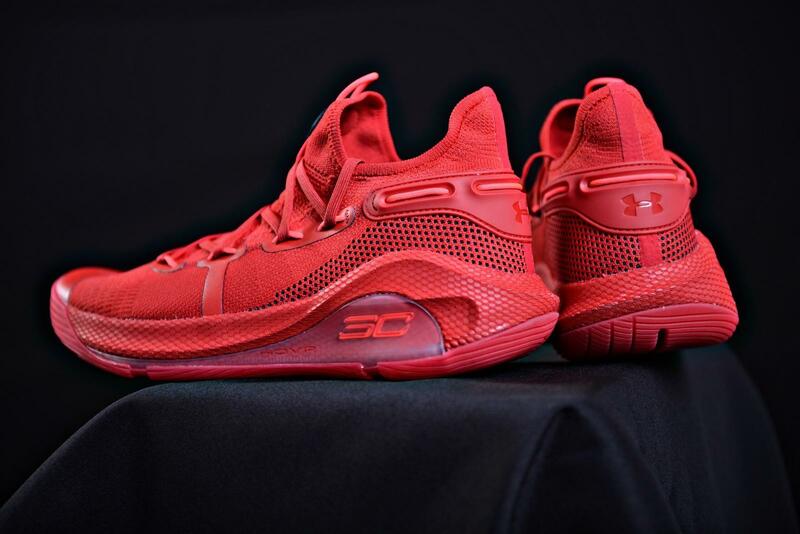 Under Curry has already come to the 6th version. 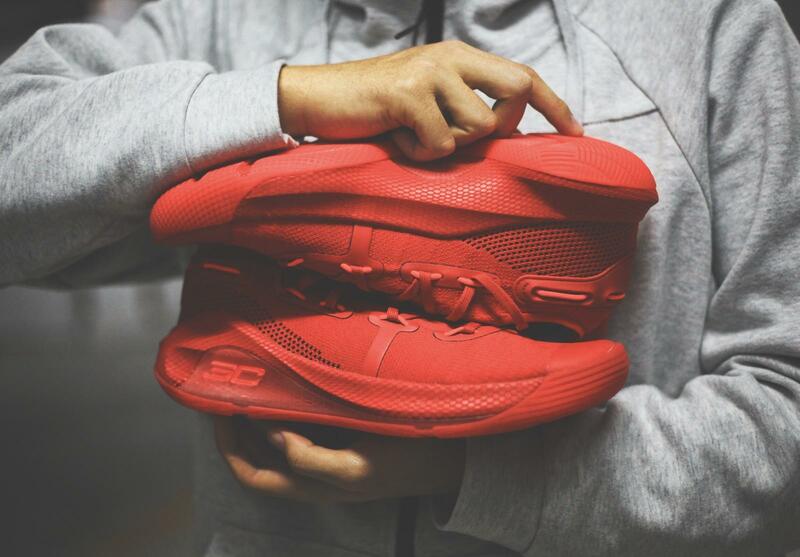 The Irving 5 has just released for less than 2 months then followed Under Curry 6’s release. 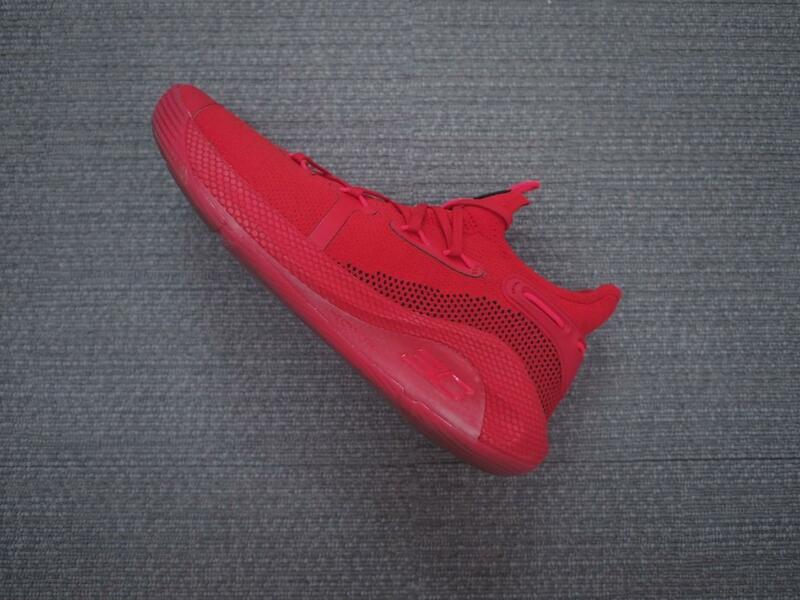 With 2019 around the corner, Under Curry 6 contains full best wishes for the new year. 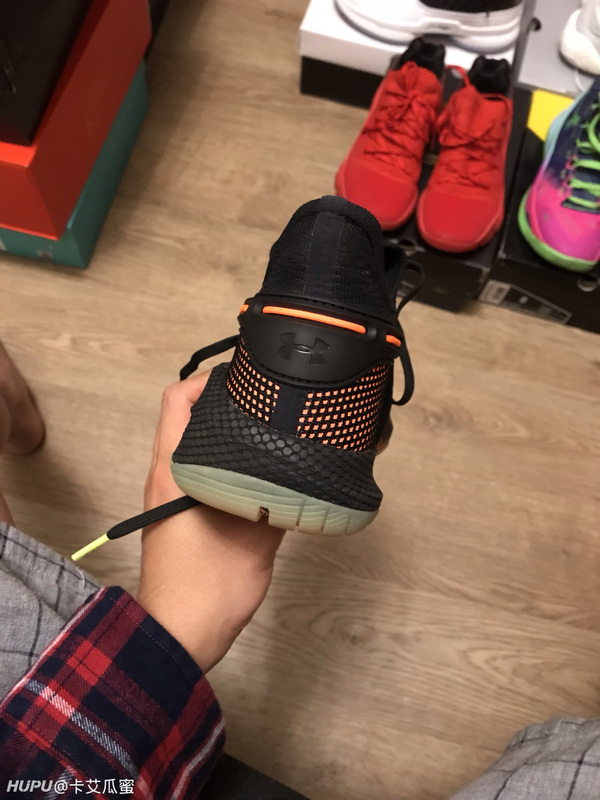 Next I’ll show you a detailed look at the shoe hoping that it might bring some help to those wanting to grab a new pair of shoes. 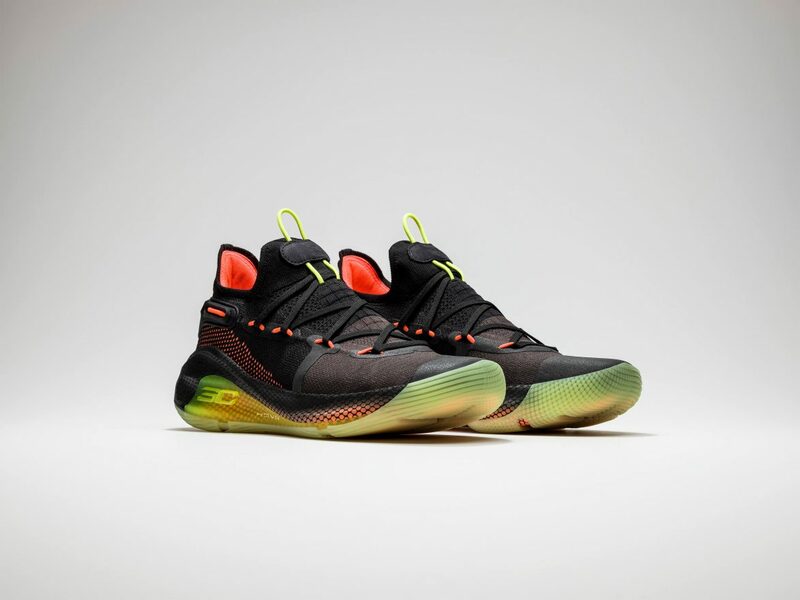 Specially designed, this Under Curry 6’s colorway is the first released. But to tell you the truth, I was quite unaccustomed to it at the first sight even after giving it some playing time. 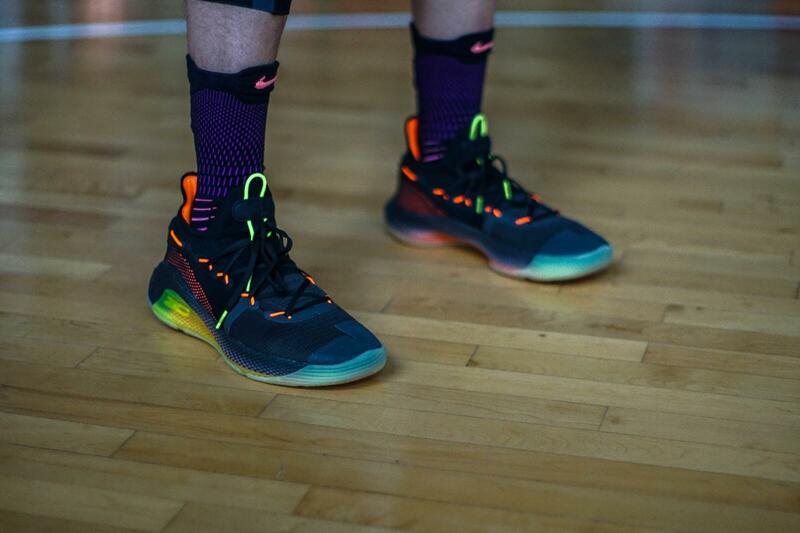 After all, the fluorescent does not match the black upper so well. However, the above are my personal view. This time it installs the woven materials which has inherited the setting of the 5th version, but it is just much thinner. 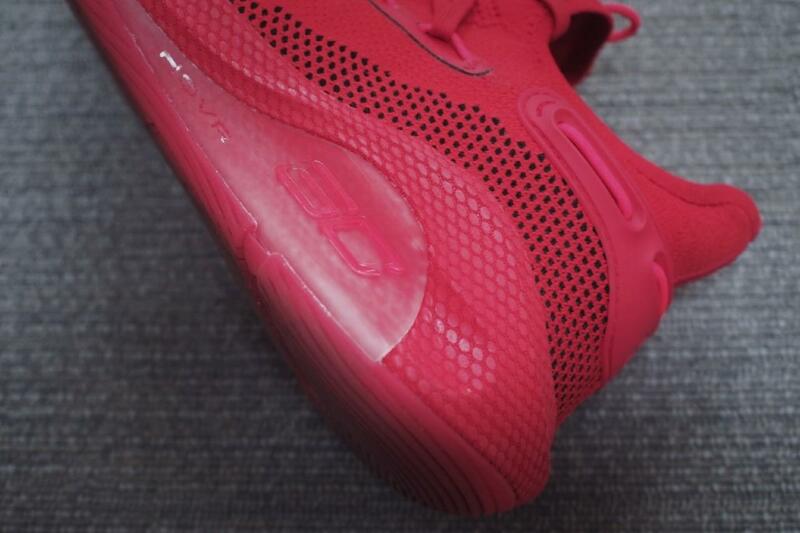 The toe part of upper has been equipped with heat welded fuse however it is a small one. 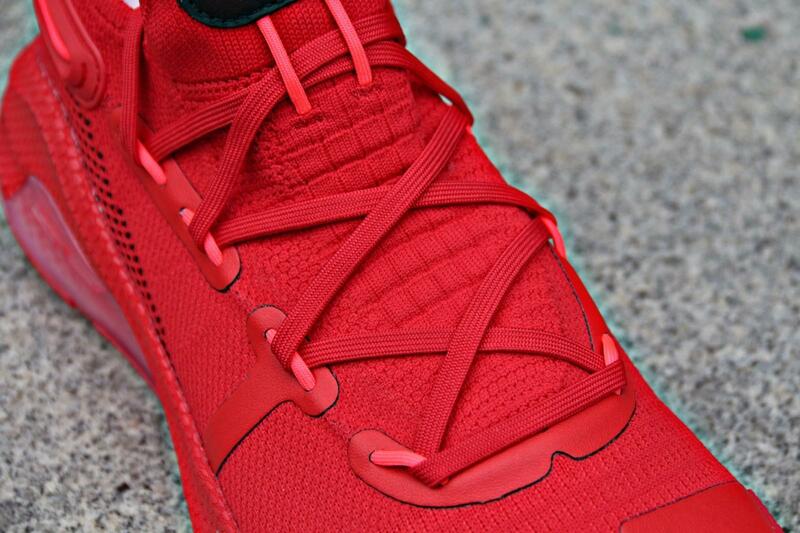 For the shoe tongue, it is made of bouncy woven materials which is going to be very popular among high insteps. 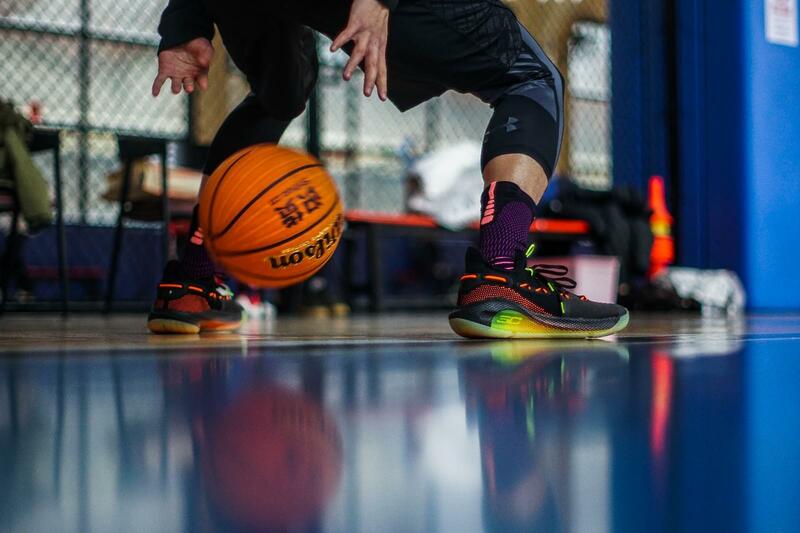 Instead of using the Anafoam, Under Curry 6’s anti-twist ability and protection have to some degree decreased. 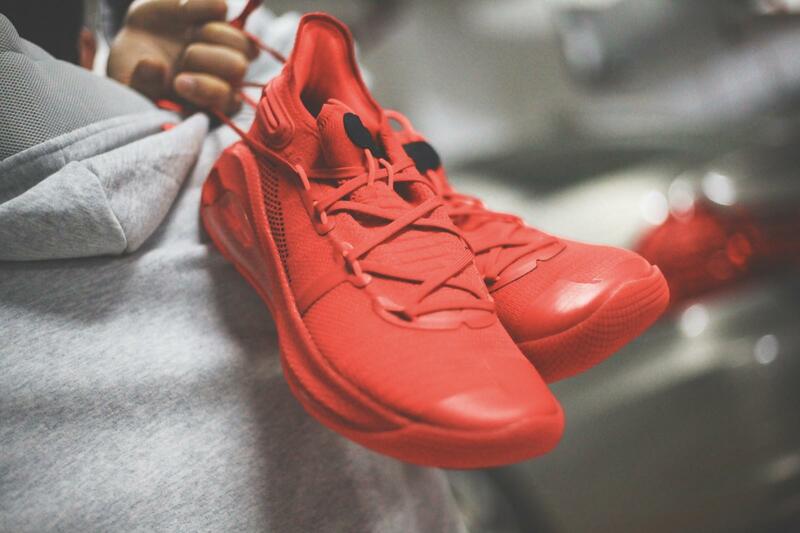 But on the other hand, the breathability is no longer absent; it is enough for you to play a long time. 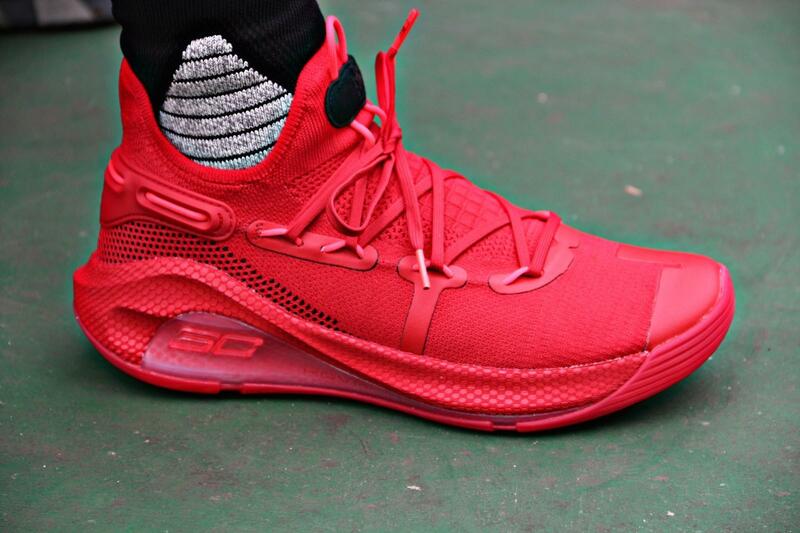 Super lightweight as this Under Curry 6 is, its wrapping is super excellent. 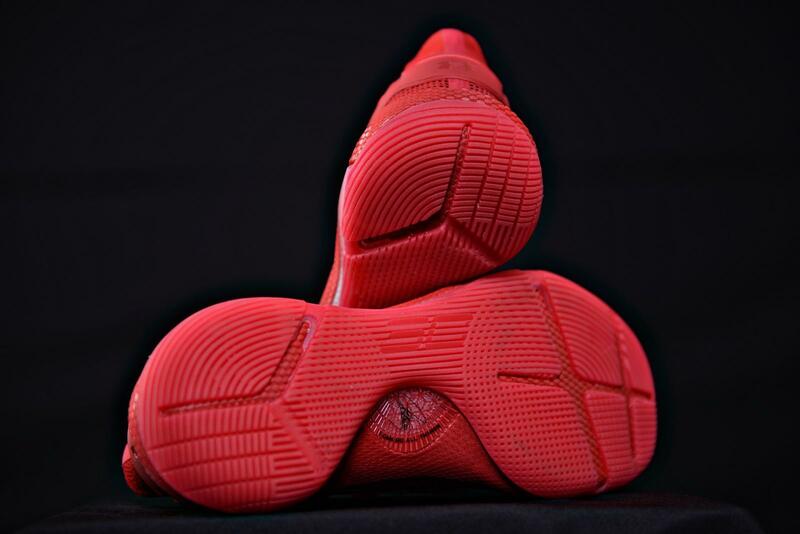 It warps your foot well and makes your foot secure in the shoe. Personally, it works quite well except for some disadvantages. 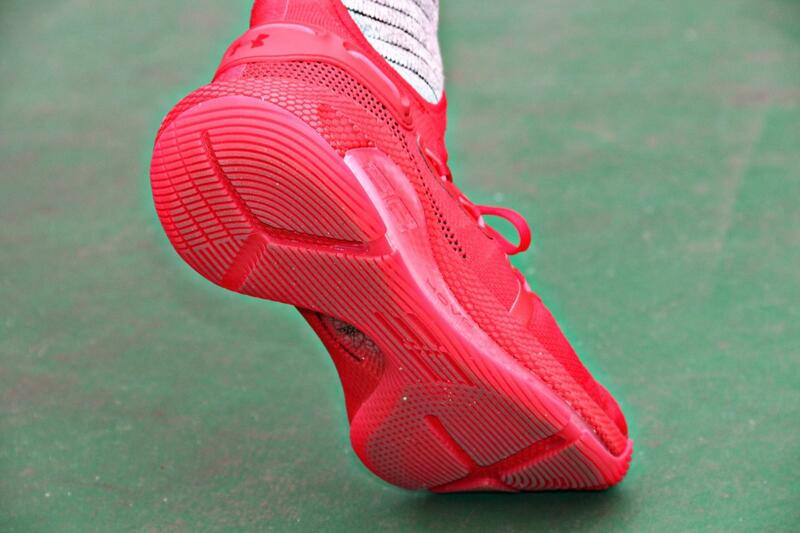 For instance, there might be some extra space for people with thinner feet, thus resulting in slipping in the shoes. 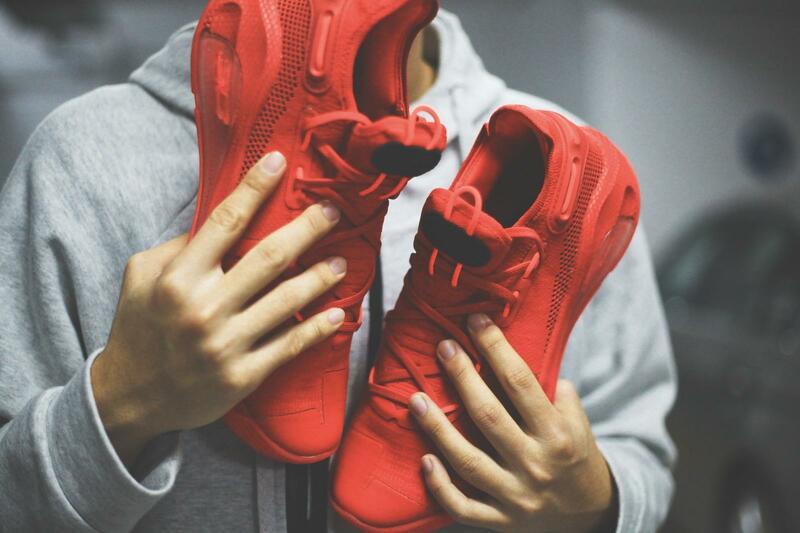 For those people, it would be better to choose a smaller size or they may want to try them on. 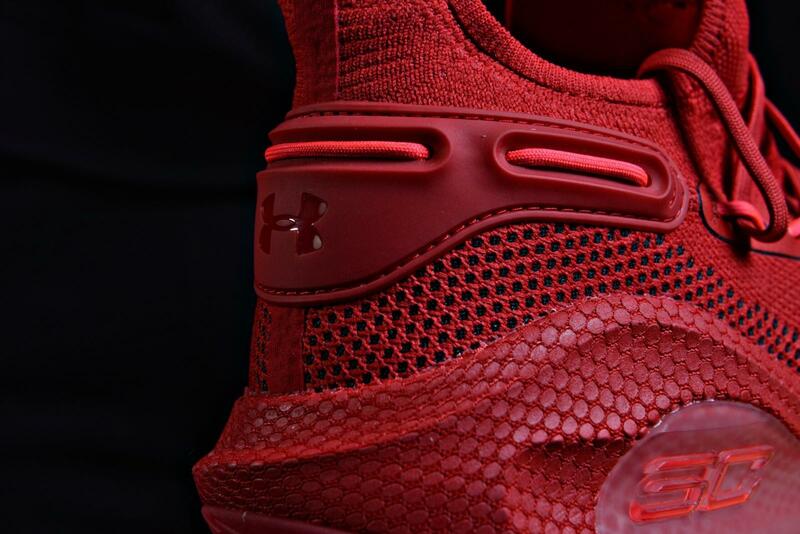 While in combat, what matters most for most people is the cushion setting in a shoe. 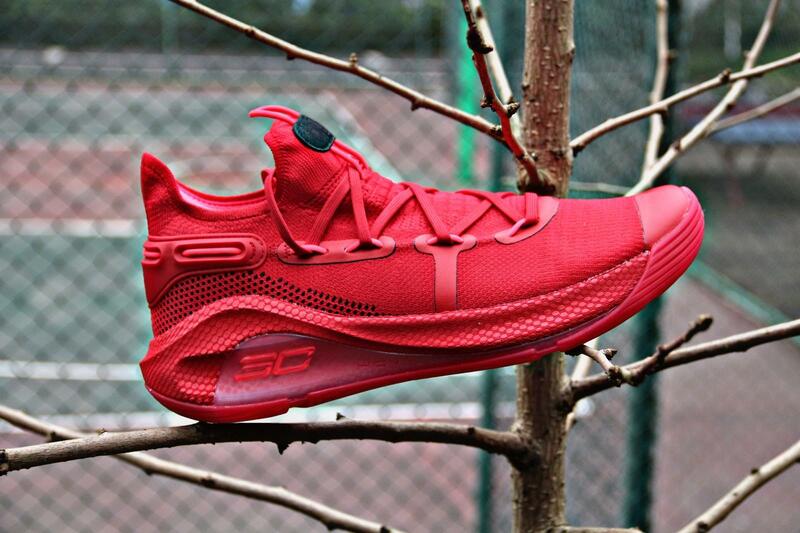 Likewise, the cushion tech of Under Curry——the HOVR is the most appealing part for me. 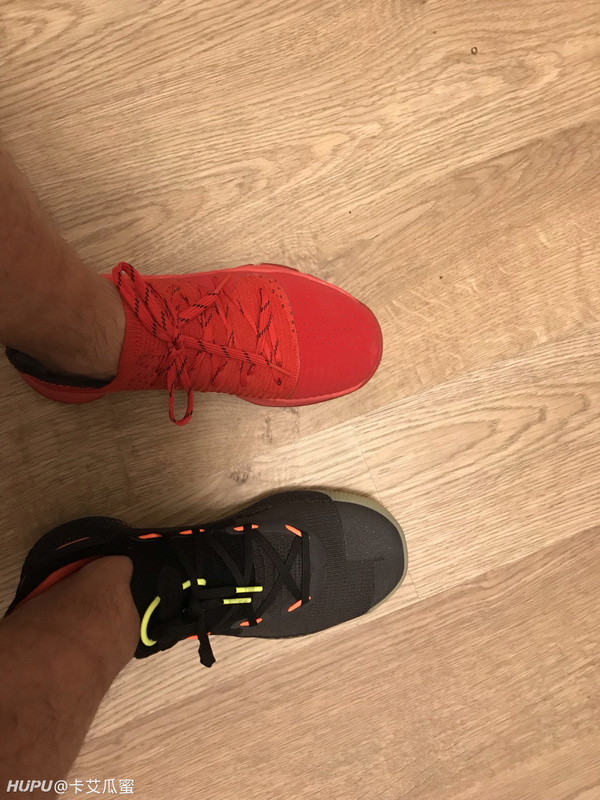 But to tell you the truth, after having wore the shoes out on the street, I was quite confused that there was nearly not any change. 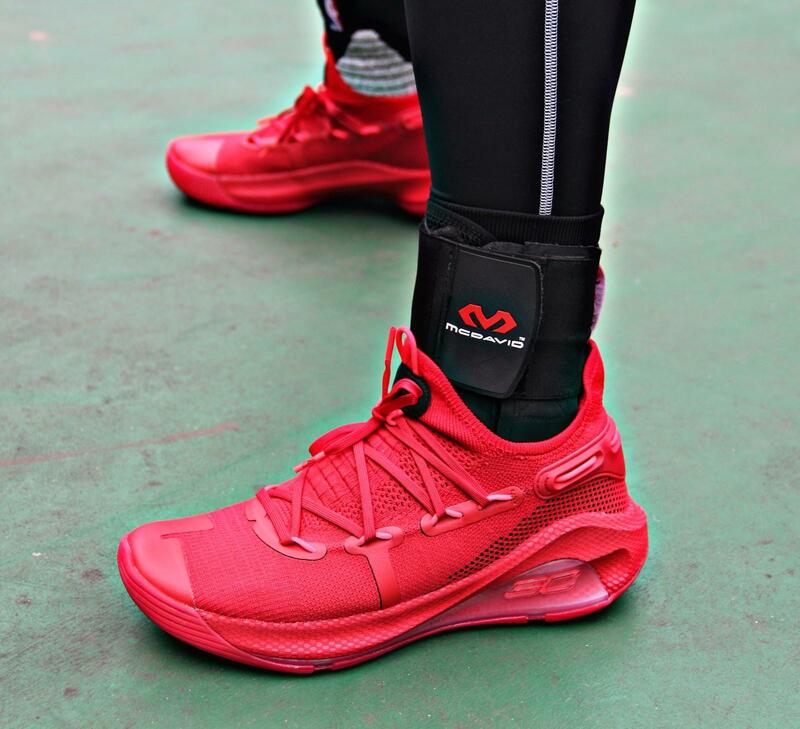 However, it was not until I played on court that I found the fact that as long as enough pressure is placed, the cushion will give you feedback. 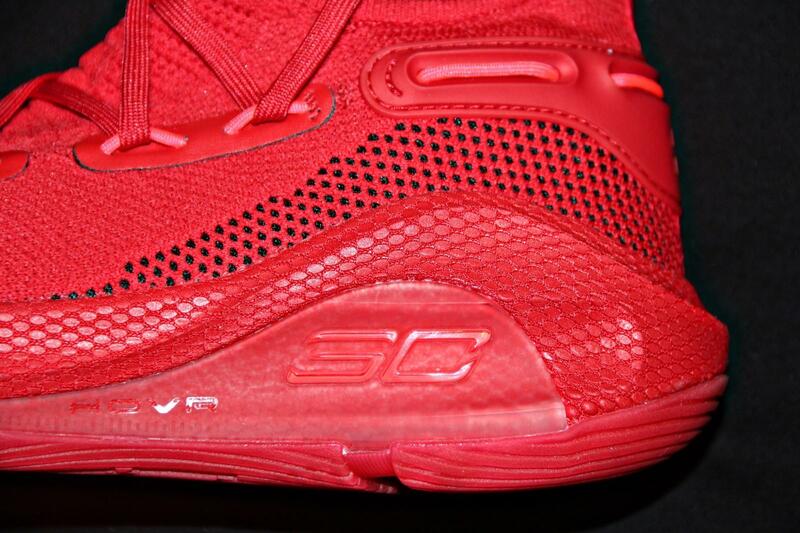 And of course, it is softer than the 5th version. 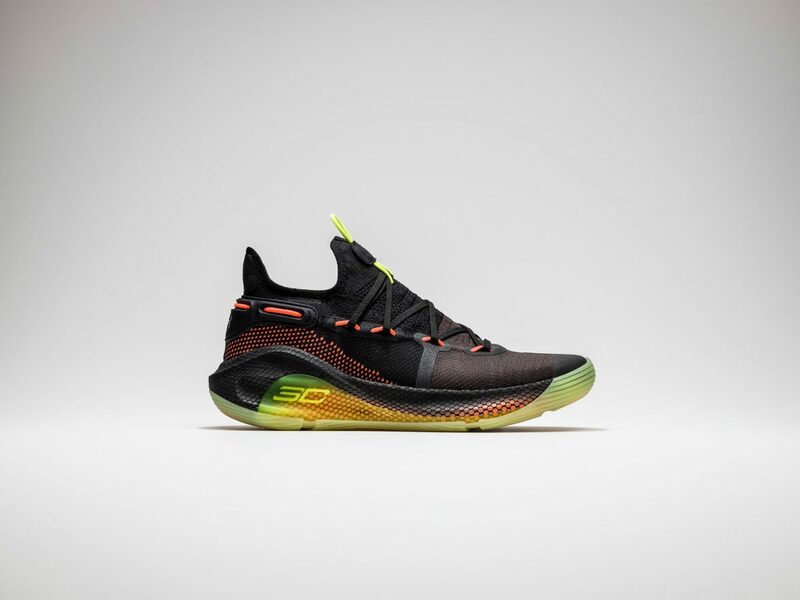 As Curry’s signature shoe, Under Curry 6 is firstly designed for Curry whose way of play is special. 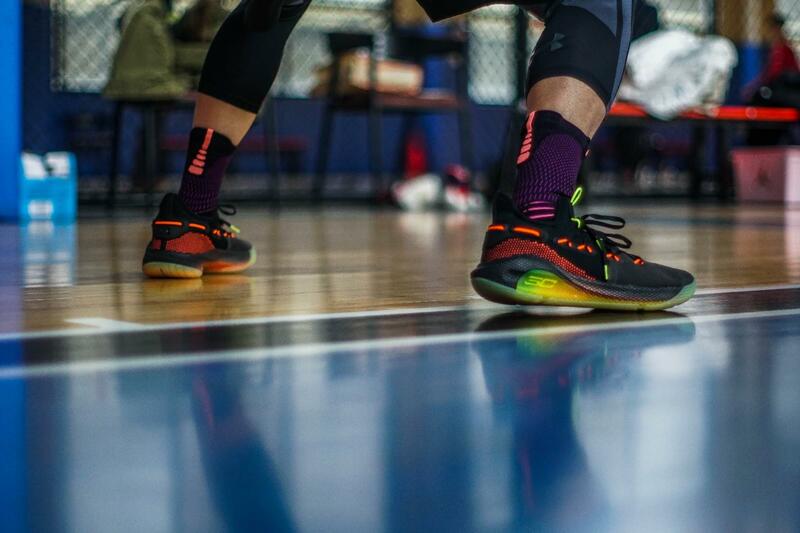 Take Curry 5 for instance, its hard midsole is particularly designed for Curry because of his way of playing. 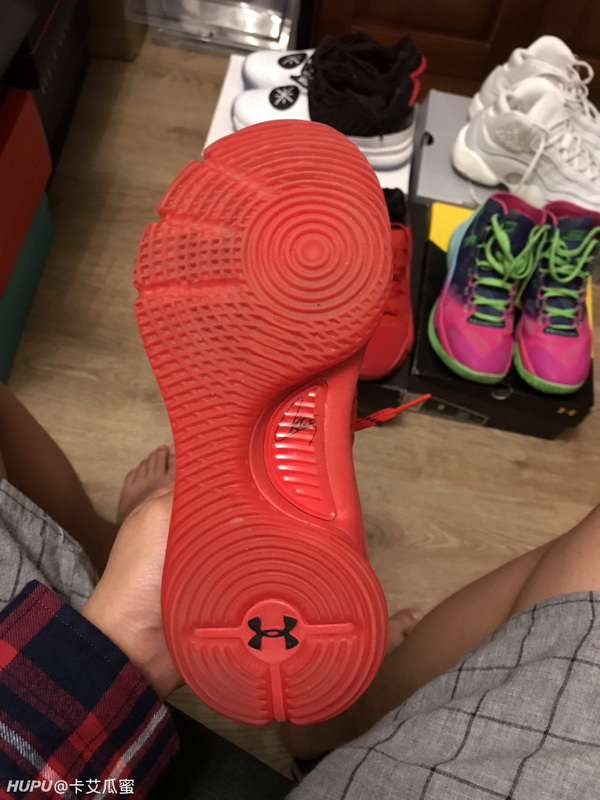 So if installed with regular HOVR cushion, surely Curry 6 can not meet Curry’s needs. 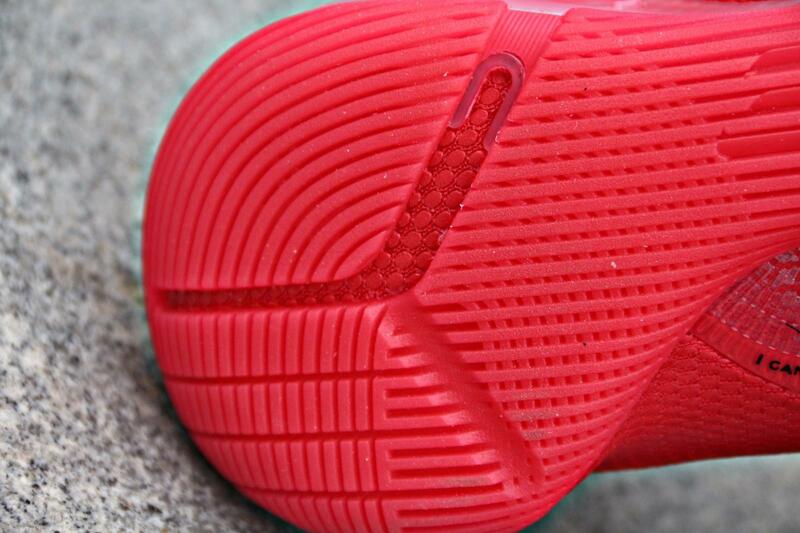 For the traction, as you can see, the pattern looks so nice. 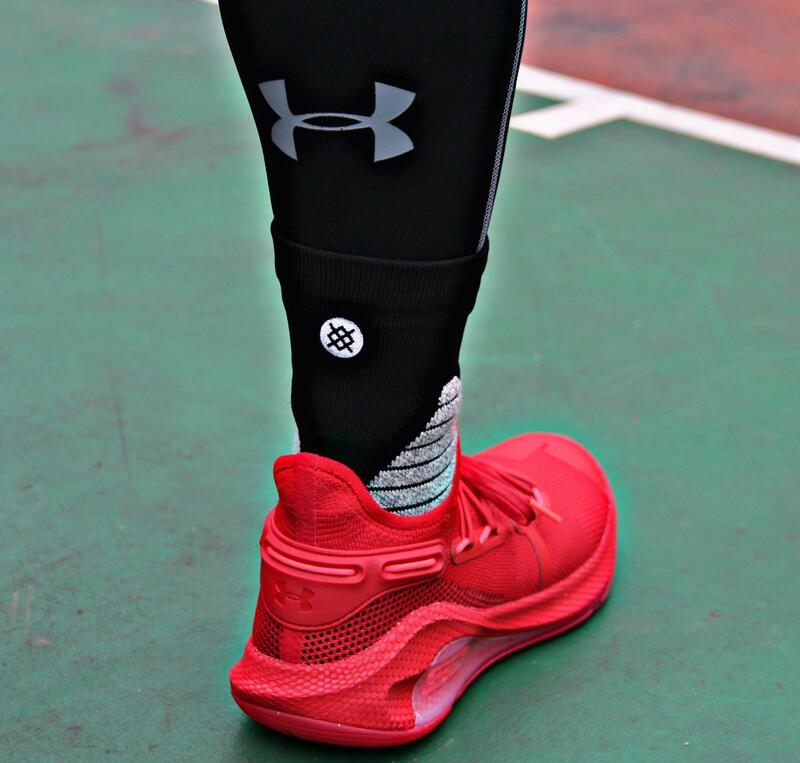 With many grains and big grooves, Curry 6 offers good multi-directional grip in all kinds of grounds. As I’ve mentioned before, provided that you find your true size, there wouldn’t be any slipping. But the traction is not perfect of course for dust will be easily invited to its surface; therefore, wiping is needed every now and then in order to keep the traction in good condition. And after wiping, you are getting your regular excellent performance. 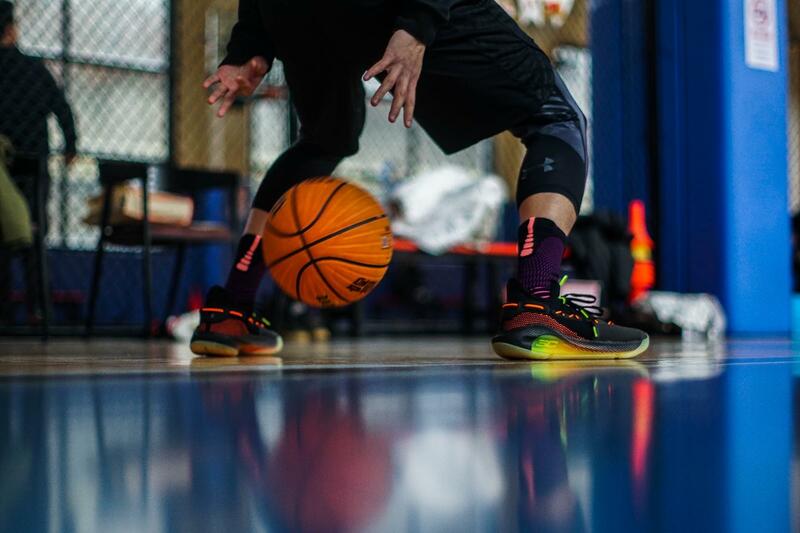 Whether there is dust or not, it has enough grip staying tuned for you. Indoors, the grip is enough; outdoors, it is also ample. So from an objective perspective, the traction is not bad; at least, it doesn’t perform very poorly. The last part is the fit. For me, it fits me snug well. 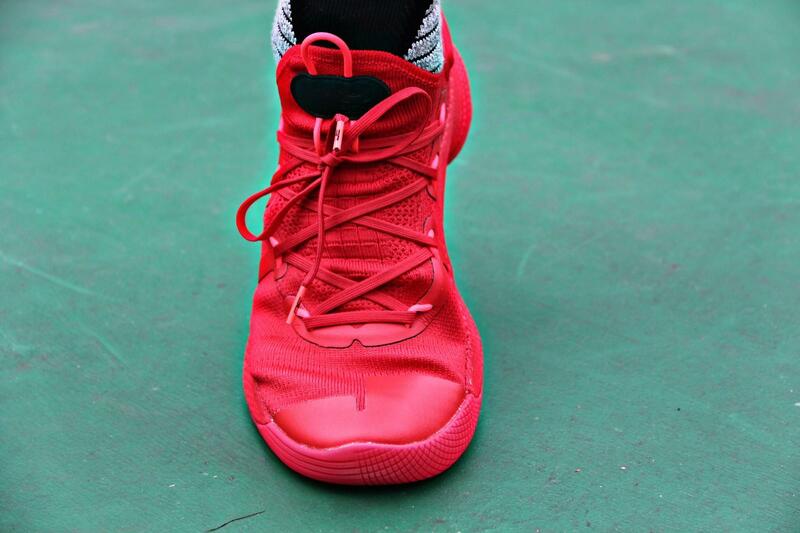 I am not wide footers in fact, so there are not any problems in this aspect. And my impression of Under Curry gets better especially after some time getting along with it. 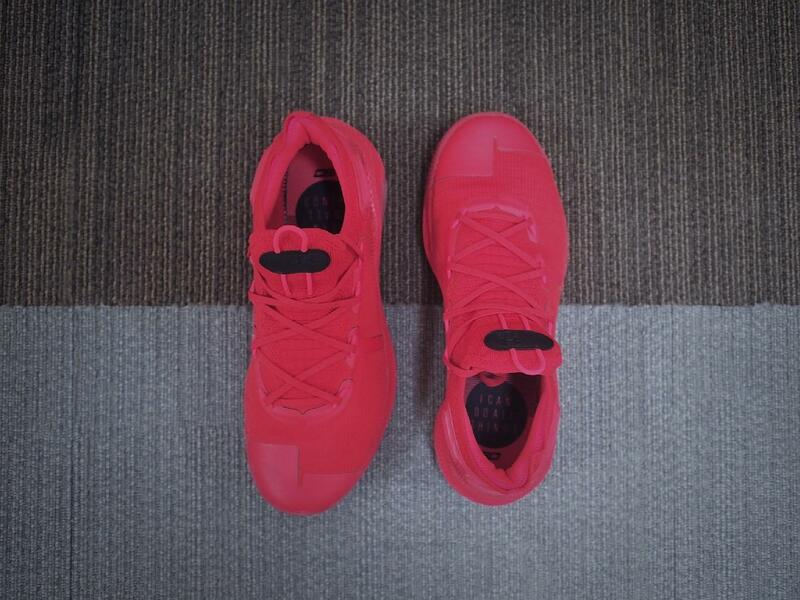 I found that the shoes feel perfect. 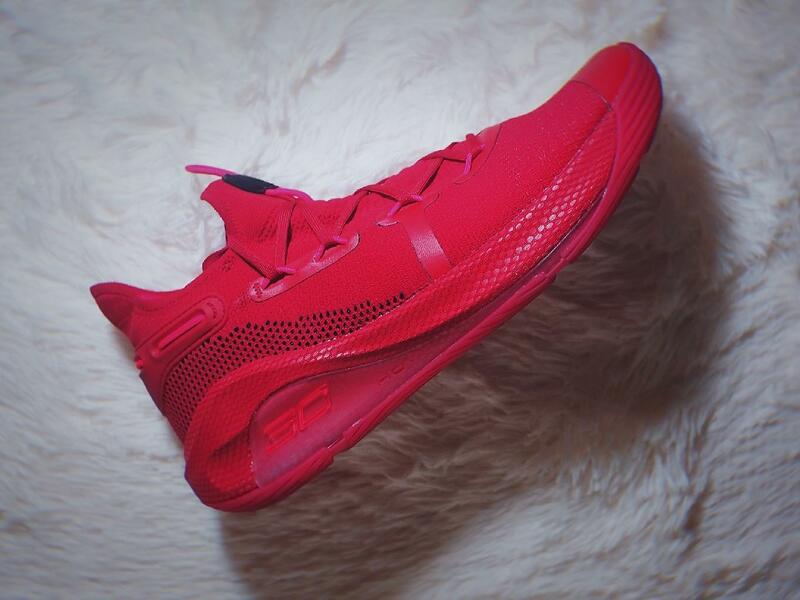 Anything going well, your initial play on them is going to be impressive. 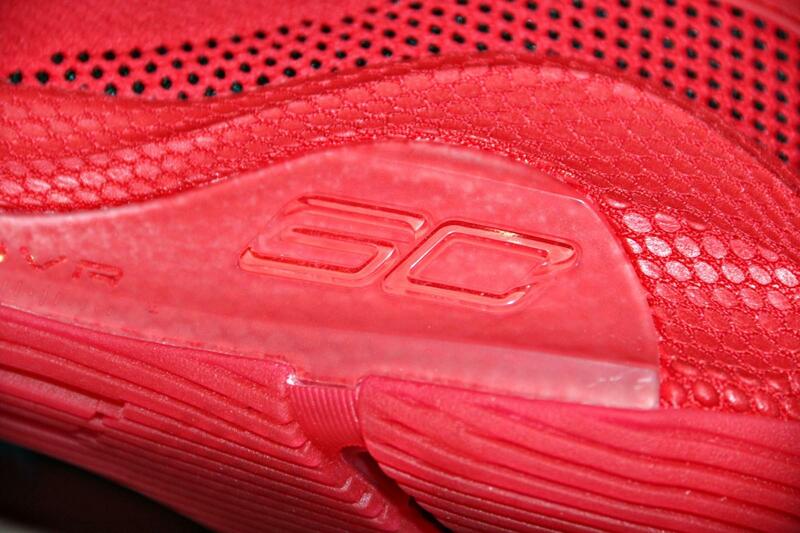 To sum up, Curry 6 is a characteristic signature shoe. 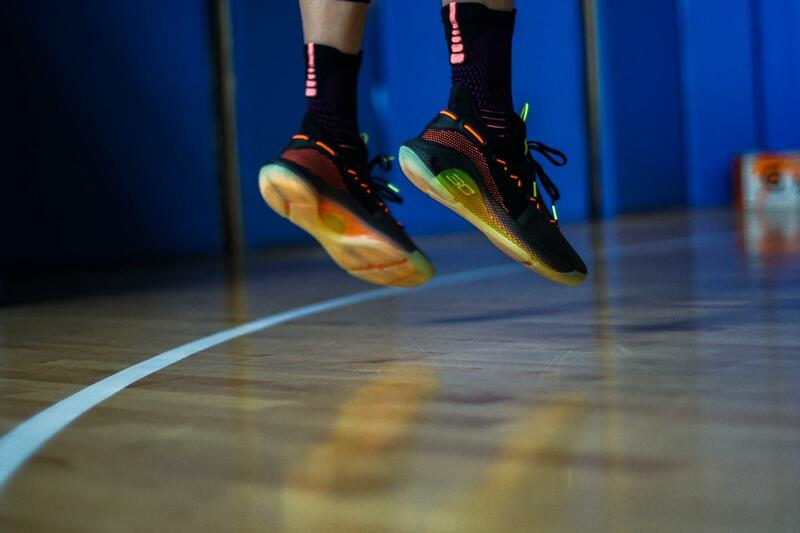 On a personal level, Curry 6 has reached its top in the court feel and its lightweight. 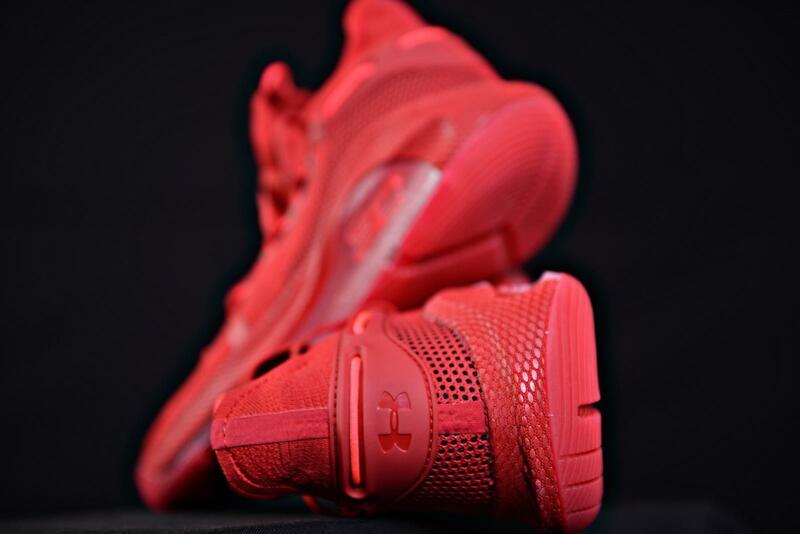 The super lightweight keeps it work for a long time; the hard midsole improves flexibility; although the grip and protection are not so satisfying. 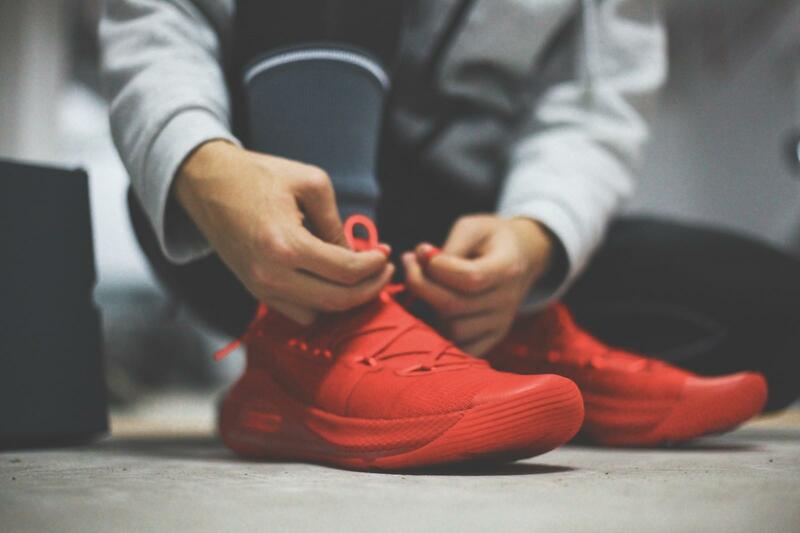 The overall of the shoes is excellent except for some flaws. 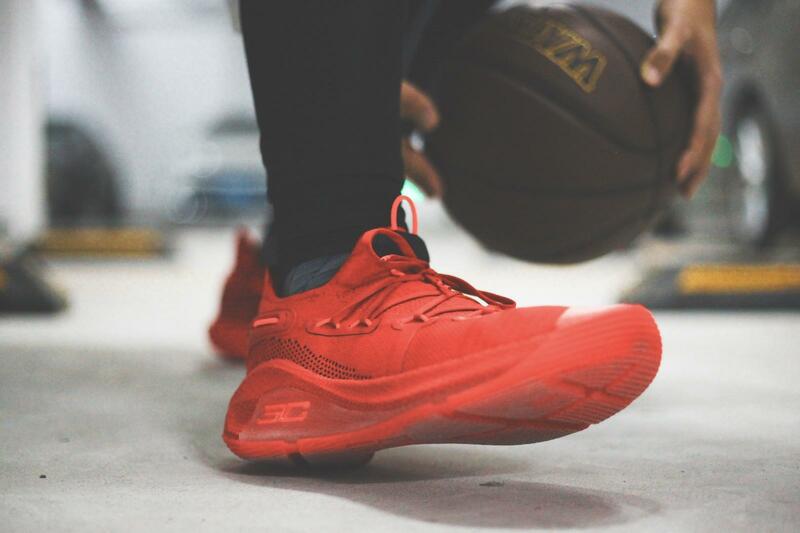 Good news is that if your way of playing resembles to Curry, then you are very likely to be into it. 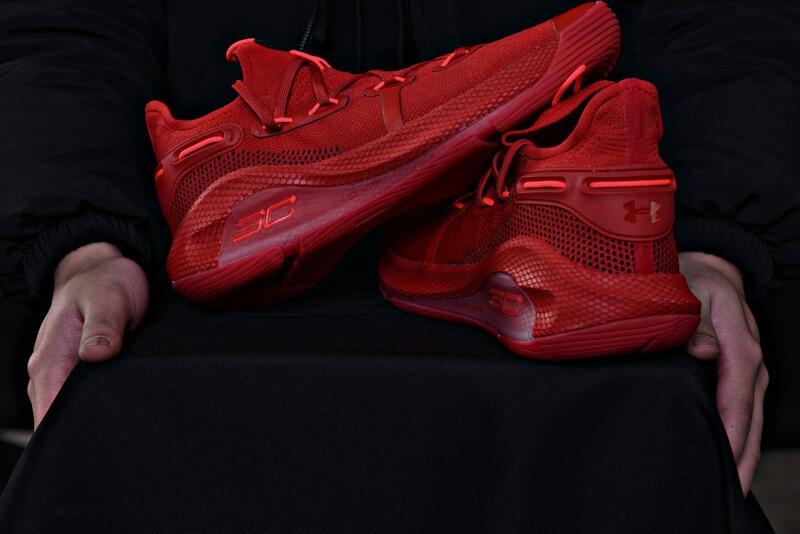 As the new year approaches, some of you, I believe, may want to buy a pair of new shoes, then you might as well have a look at today’s protagonist——Under Armour Curry 6. 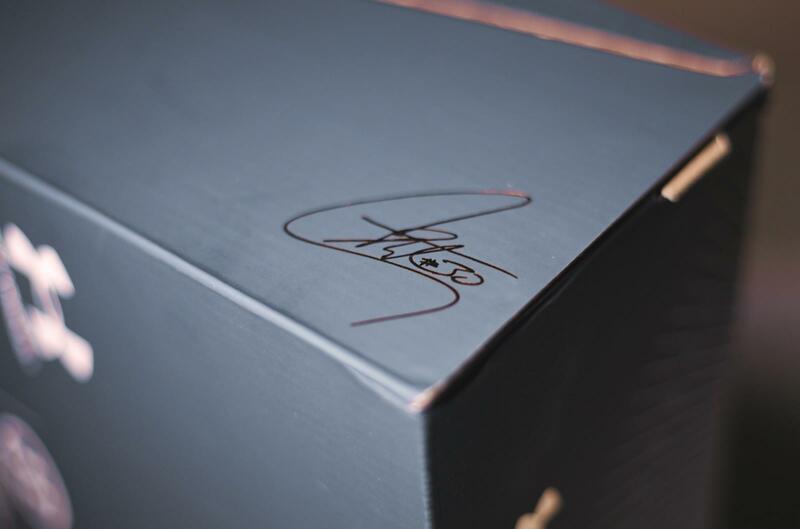 First of all, we’ll have a look at the shoe box. 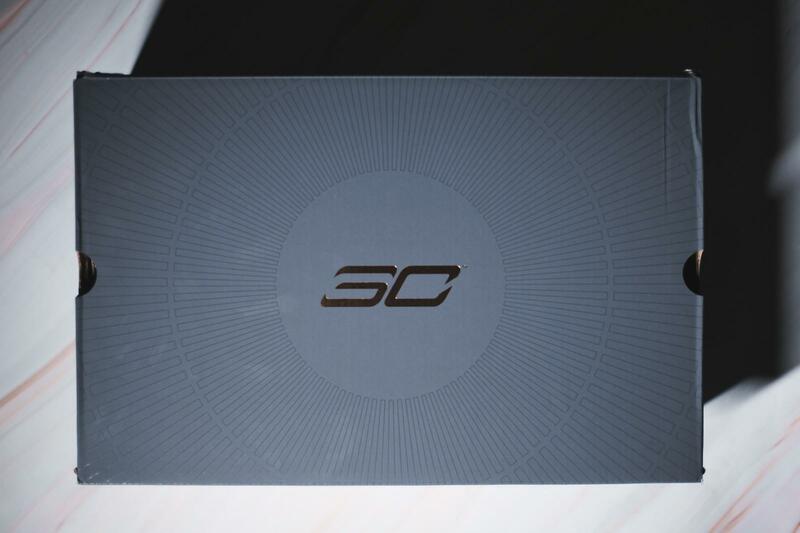 From the pictures below, we can see Curry’s personal logo in the middle of the cover. 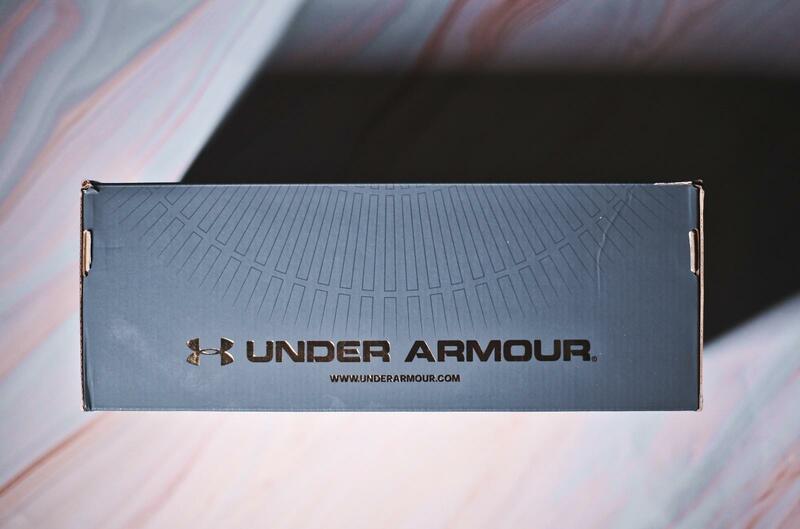 And with the cold gray and Curry’s signature and above all, the embellished Under Armour logo, the whole box is very pleasing to the eye. 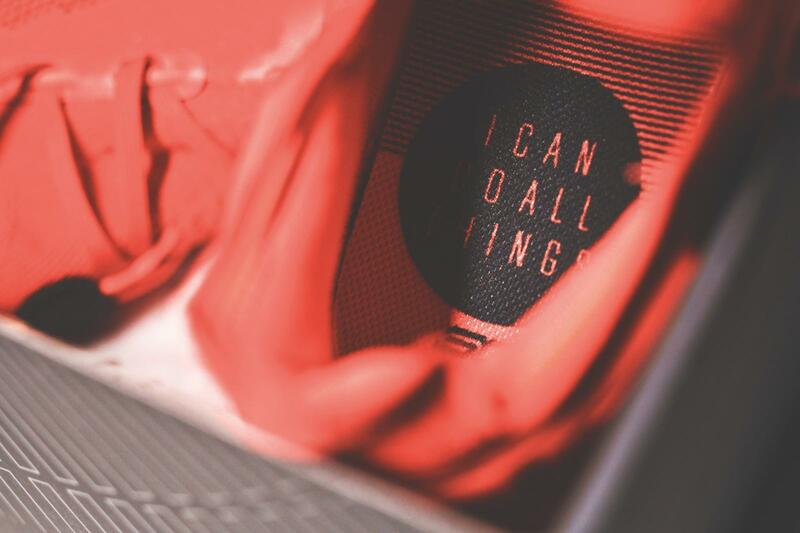 As we go on, the bright red first come into sight. 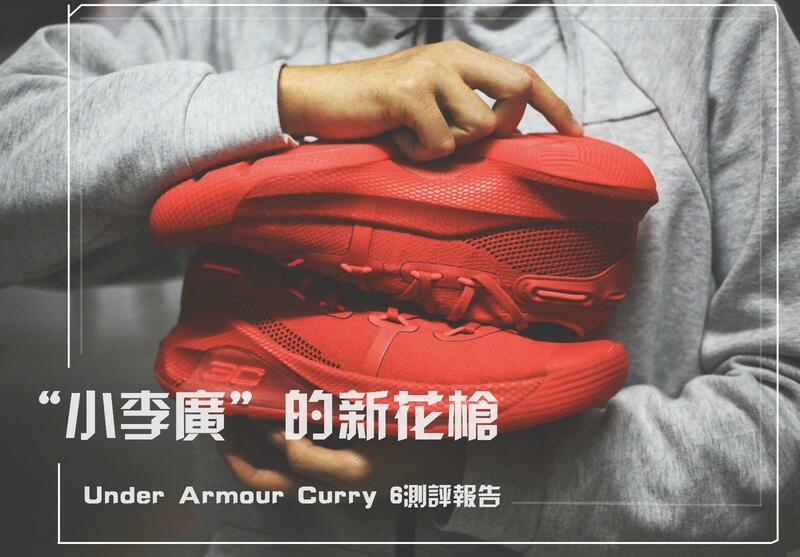 Named “Heart of the Town”, Curry 6 is to pay tribute to Auckland, which has seen Curry’s “growth” and given him lots of energy. 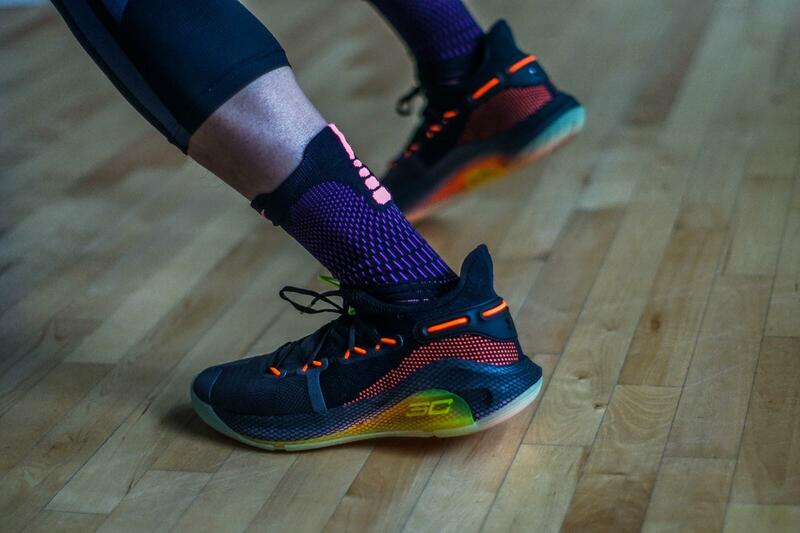 For its colorway, this Curry 6 is unique among the other Curry 6. 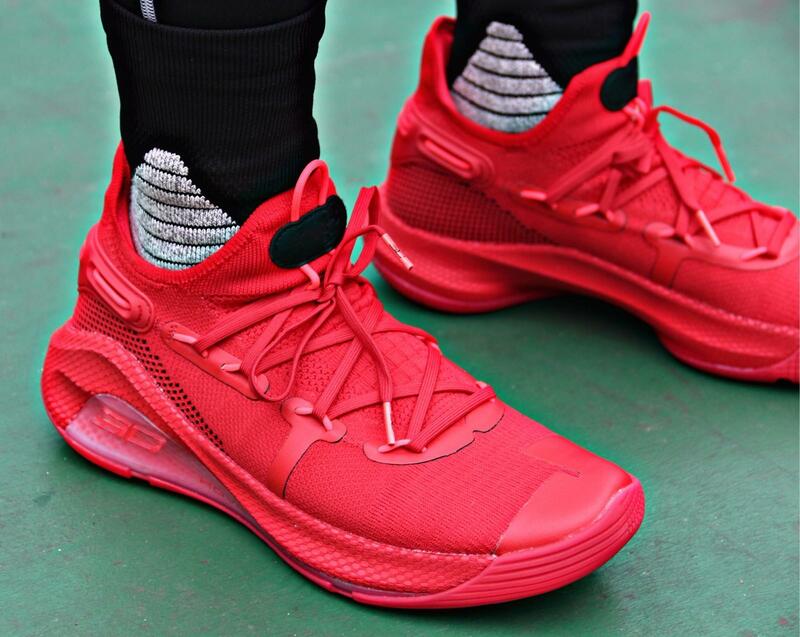 The bright red, which is energetic and full of passion, along with some black decoration makes this Curry 6 especially discernible. 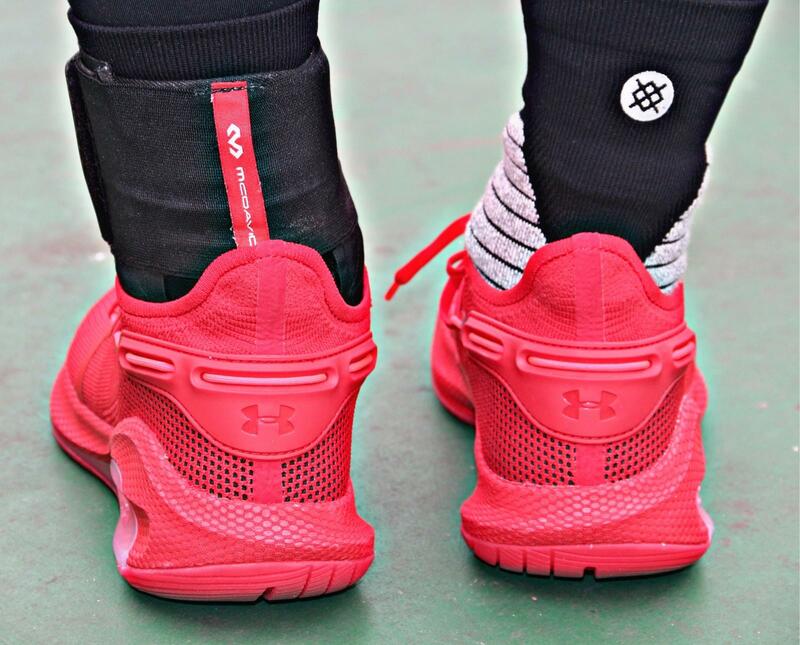 At the heel part, there is also a Curry’s personal logo and a Under Armour logo. 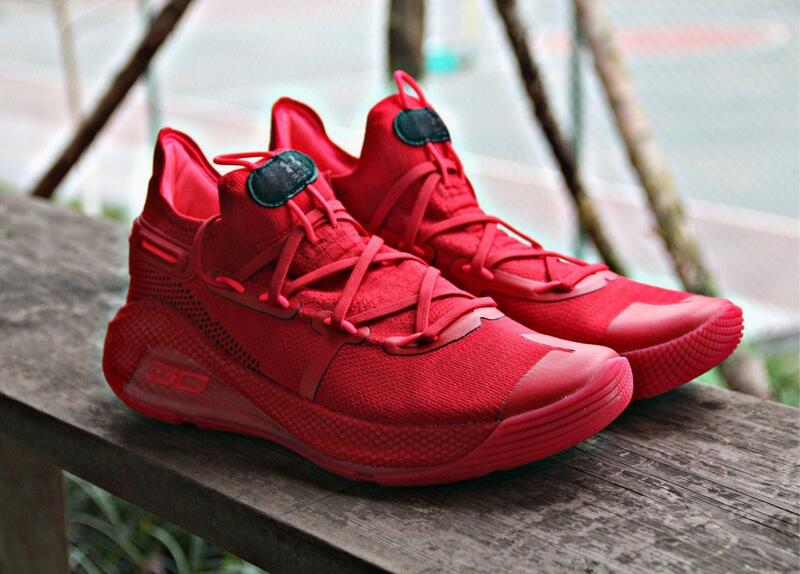 In the inner part there lays Curry’s motto——”I CAN DO ALL THINGS”. 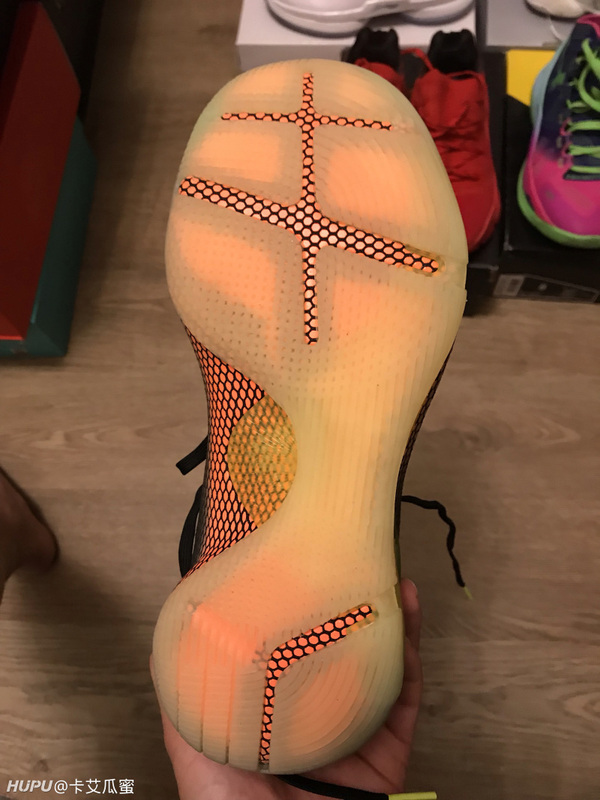 For its material: this Curry 6 impresses me a lot because it is super light. 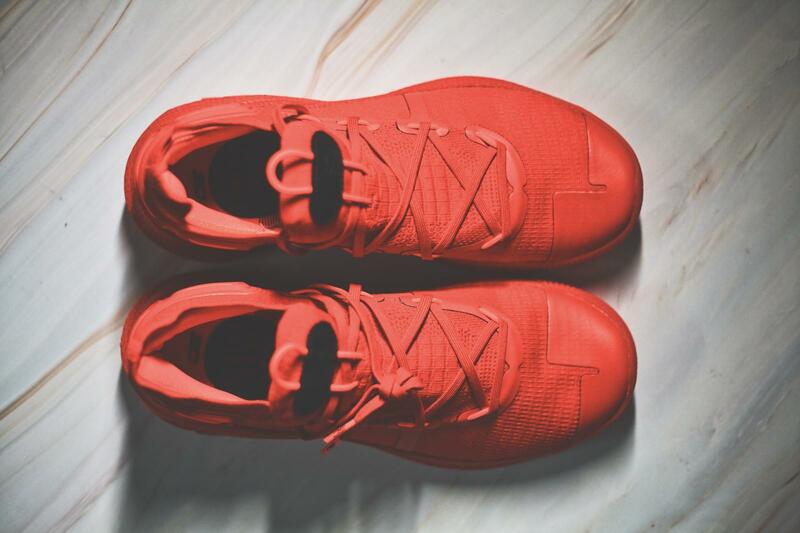 The upper is made of woven material and the midsole is equipped with HOVR tech, so definitely it has an excellent performance in this aspect. Not only is the upper light, but it is also thin. 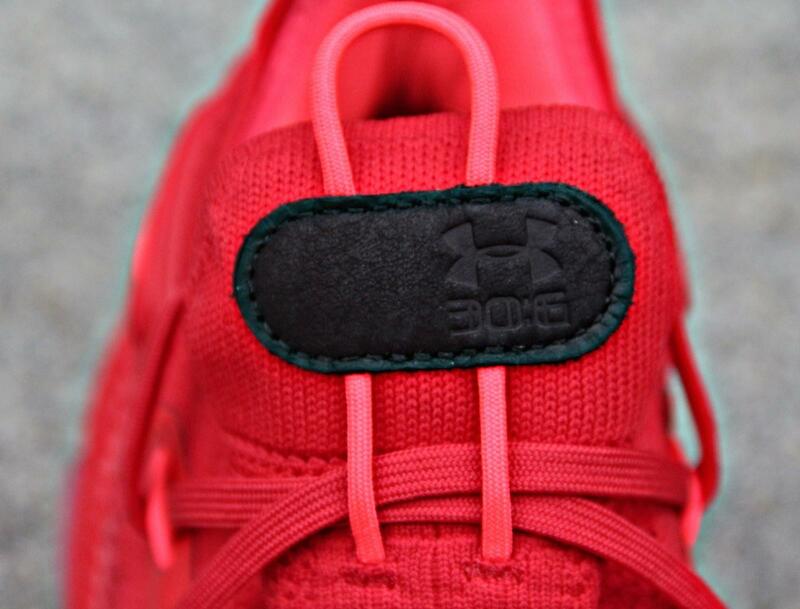 Thin as it is, the upper is hard enough to protect your foot. 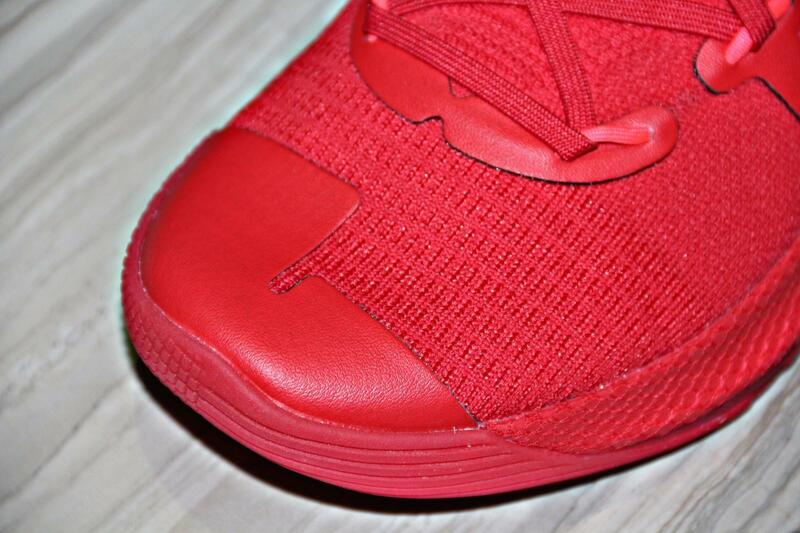 On top of that, the leather toe protection is added in the toe part. 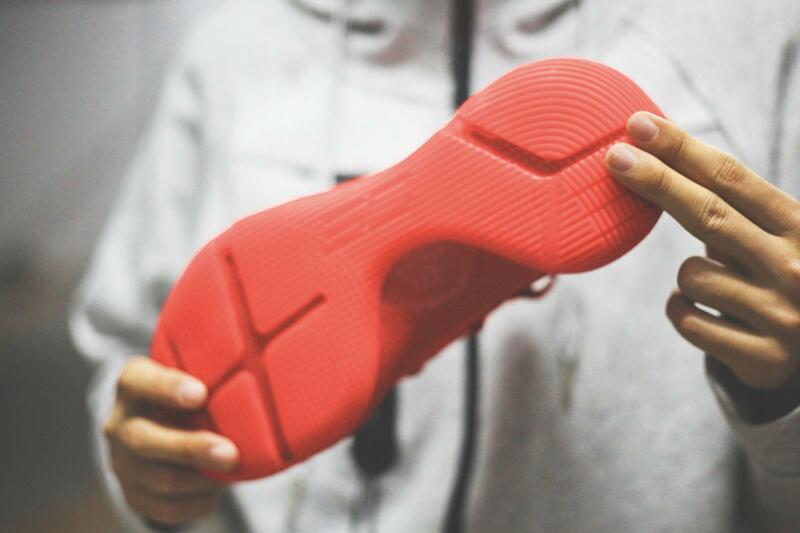 Besides, the tongue is so soft that wearers can easily put them on. 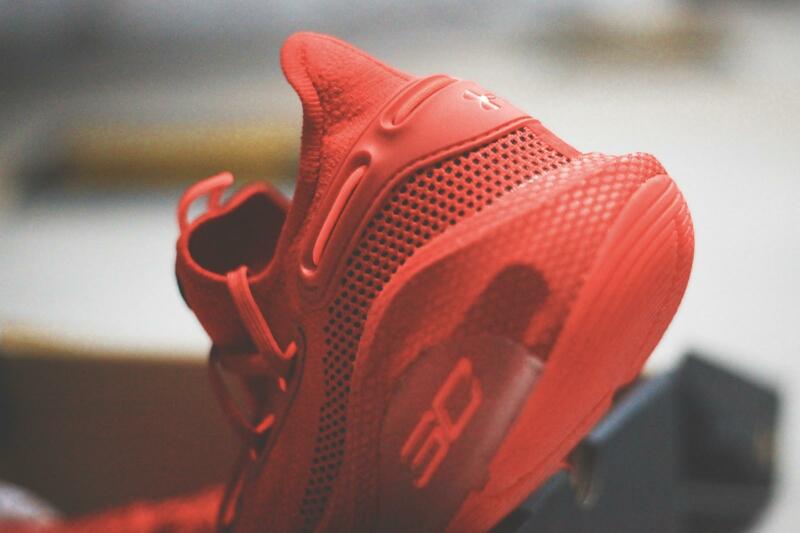 But what appeals me most is that the grid HOVR in the midsole and the protective TPU both make Curry 6 distinguished. Such kind of combination is quite characteristic. 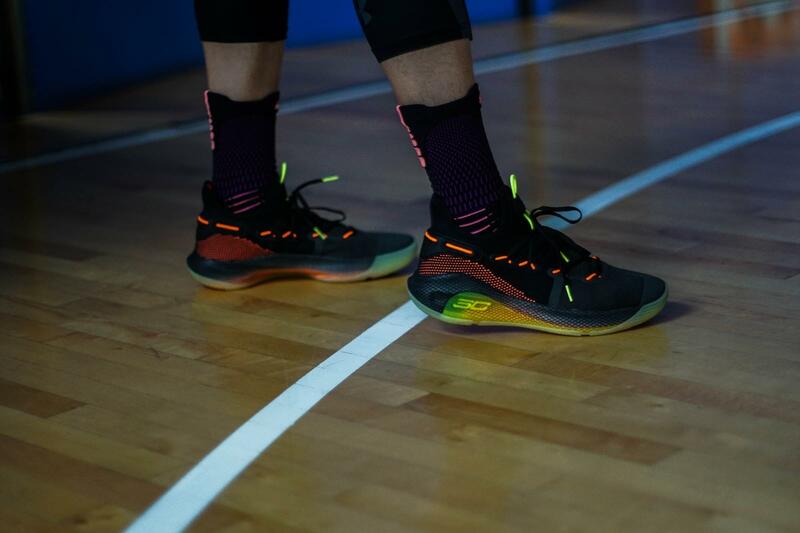 What is intriguing is that the shoe lace design of Curry 6 is a bit novel though it is similar to Curry 3 zero 2. 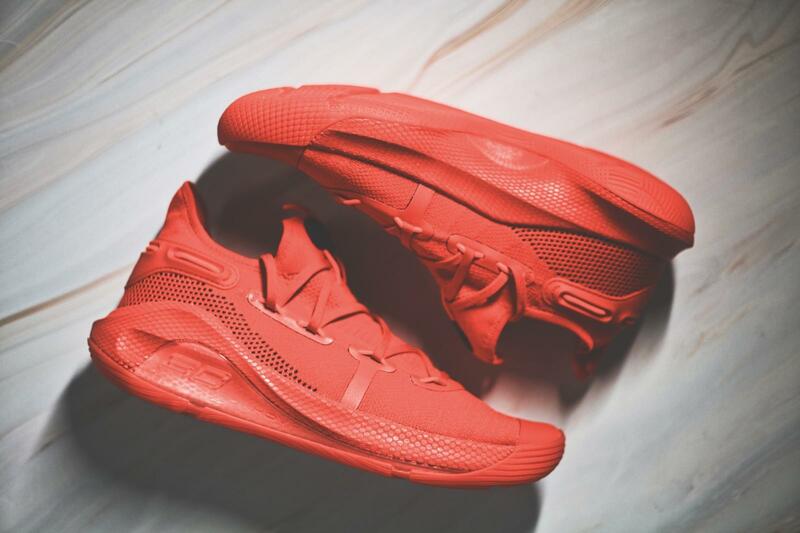 For its traction: Thank to the novel outsole grains along the whole foot Speed Plate tech, they’ve made Curry 6 out of an remarkable sneaker. 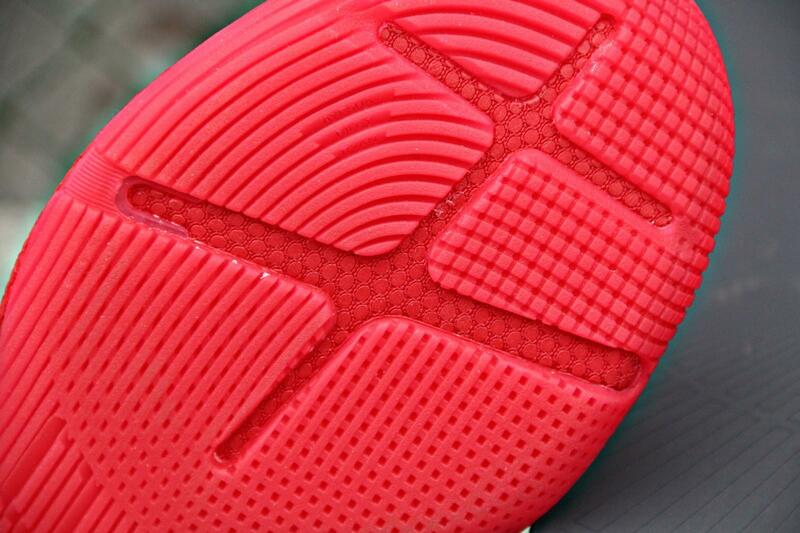 Whether there is dust or not, the traction pattern on the lateral side offers super multi-directional grip. 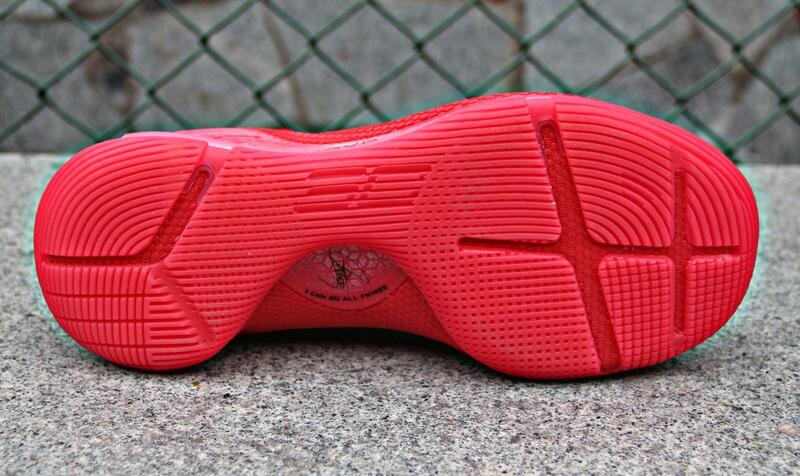 The spirals in the outsole is not only pleasant to the eye, but for offering a certain degree of protection. But if dust is in, you might need some wiping. All needs are meet, you are going to get a fabulous experience. 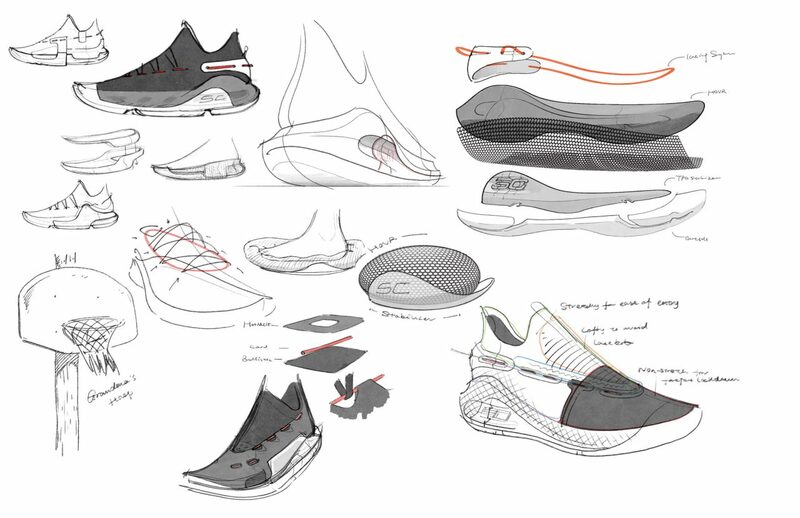 For its wrapping: From an objective perspective, all shoes have their respective advantages. 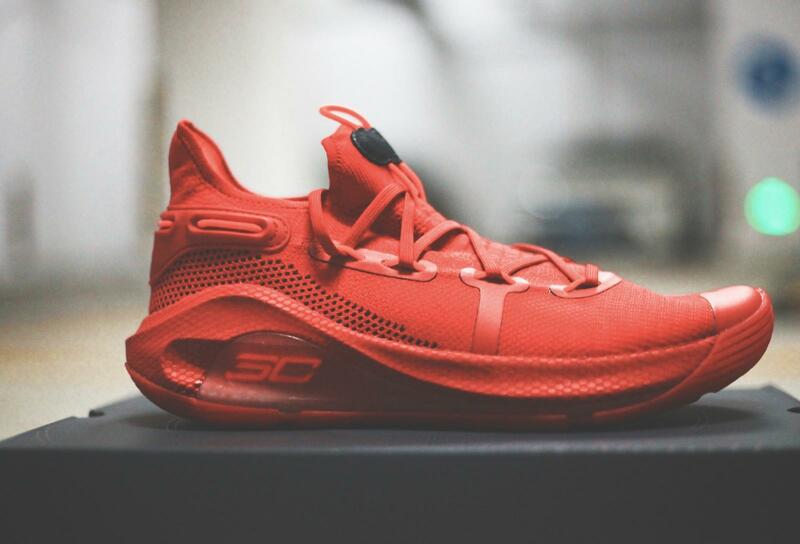 But for Curry 6, I have to say it is in fact very excellent. 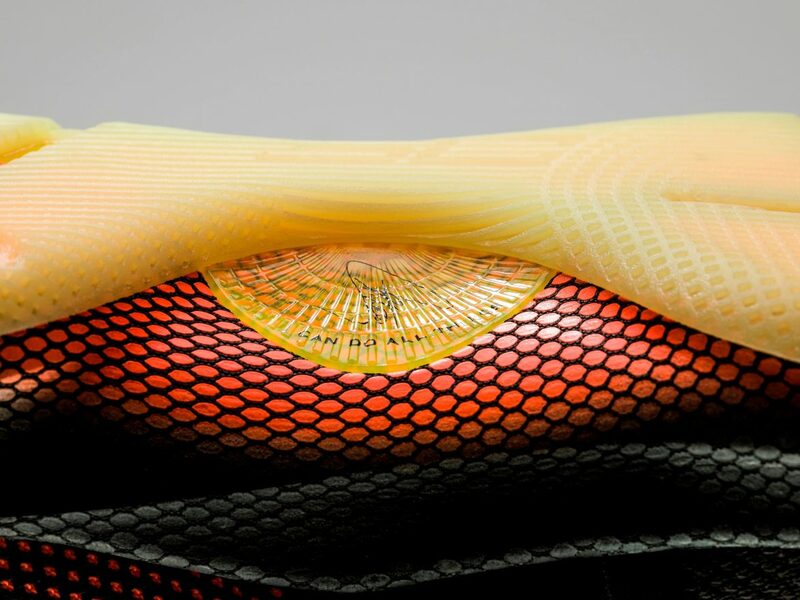 The spot-on wrapping will make you unwilling to take it off. 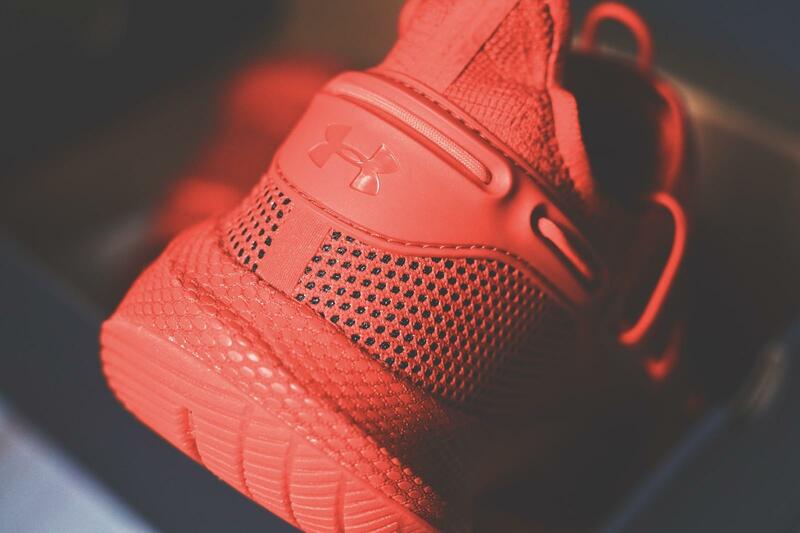 For its cushioning: It seems that cushioning is of great significance for most Asian consumers. 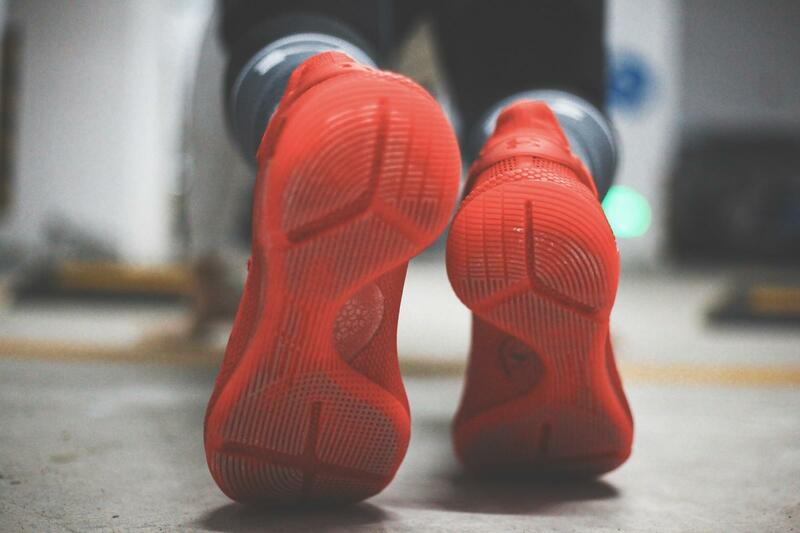 As a matter of fact, we often get into the dilemma that we excessively run after cushioning so that we might not find a suitable shoe. 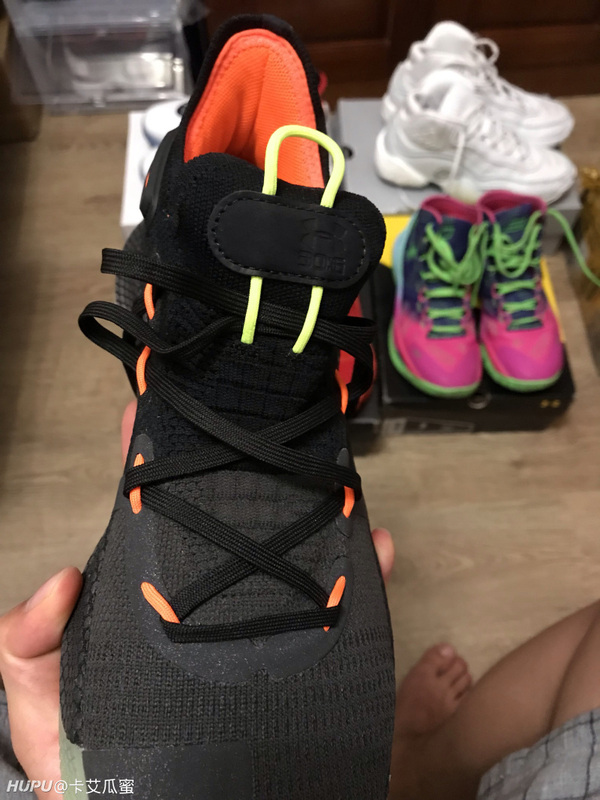 In this Curry 6, full-length HOVR cushioning is used and it’s the entire midsole. 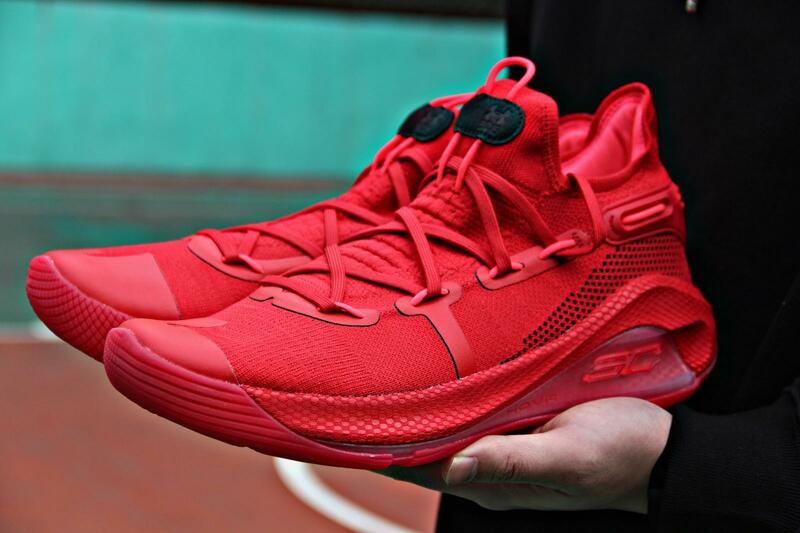 Also, chances are that after having played in this Curry shoe, you are most likely to be obsessed with it and you’ll feel it is something of a bouncy foam. 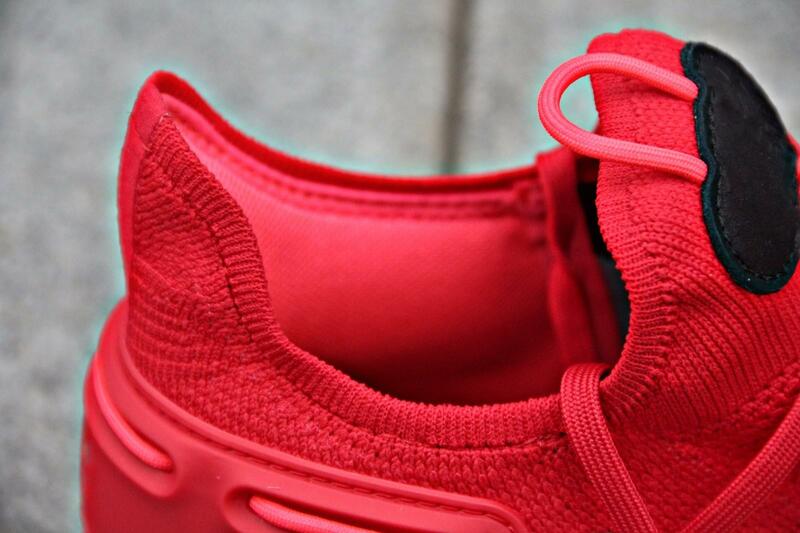 For the fit: Given that the elasticity of the upper is comparatively weak, here I suggest that you choose a bigger size. But if you’d like to a loose effect, then there is no need choosing a bigger size. 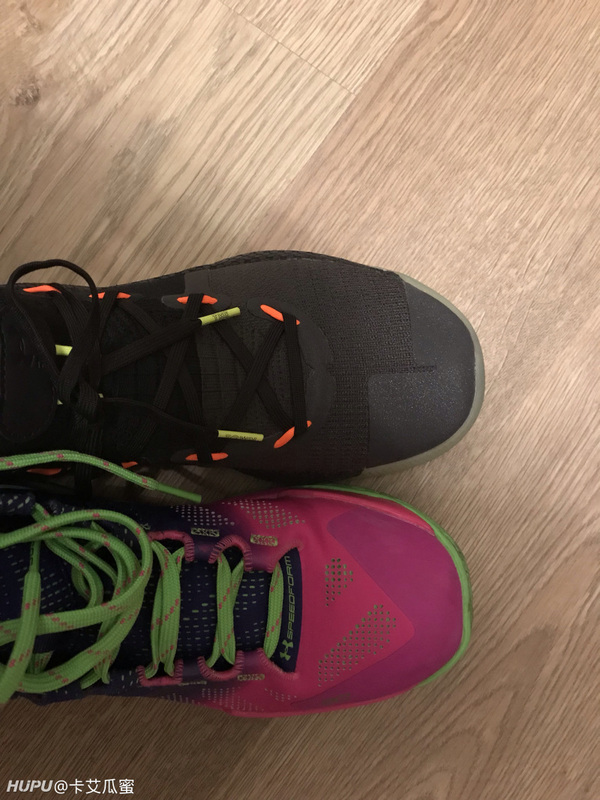 The fact that I am a wide footer has brought about some flaws. 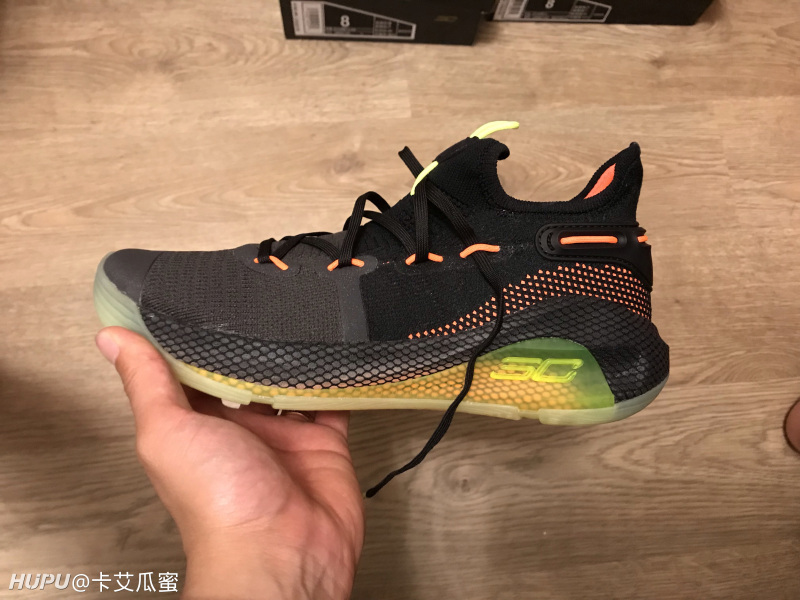 The first time I tried on Curry 6, in fact, the process is not so satisfactory and I cannot get used to it soon. 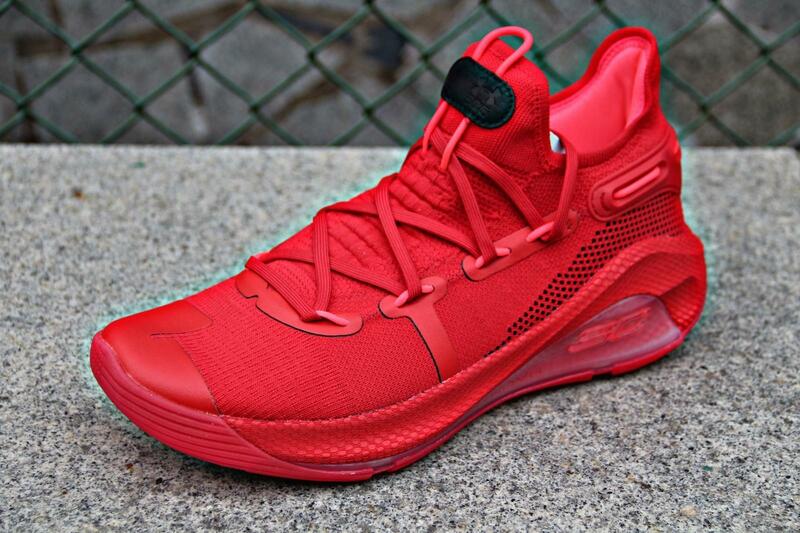 However, some time later I find them super comfortable. 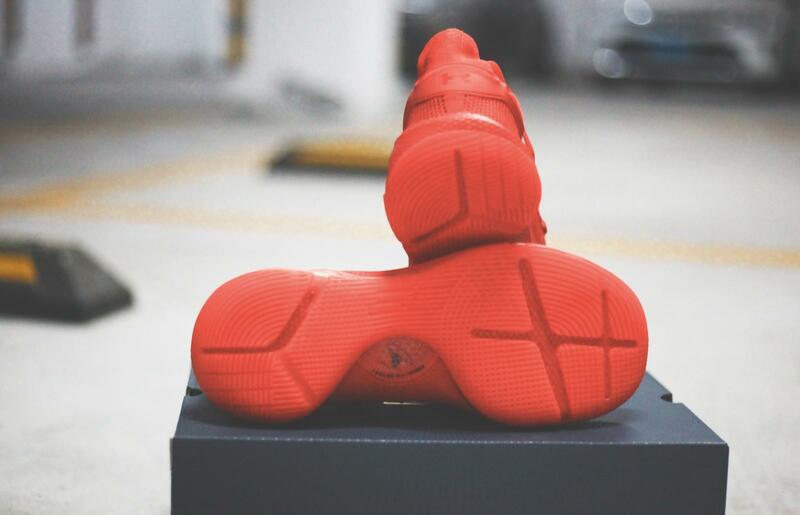 So wide footers may go and try them on in case such situation brings you disappointment. 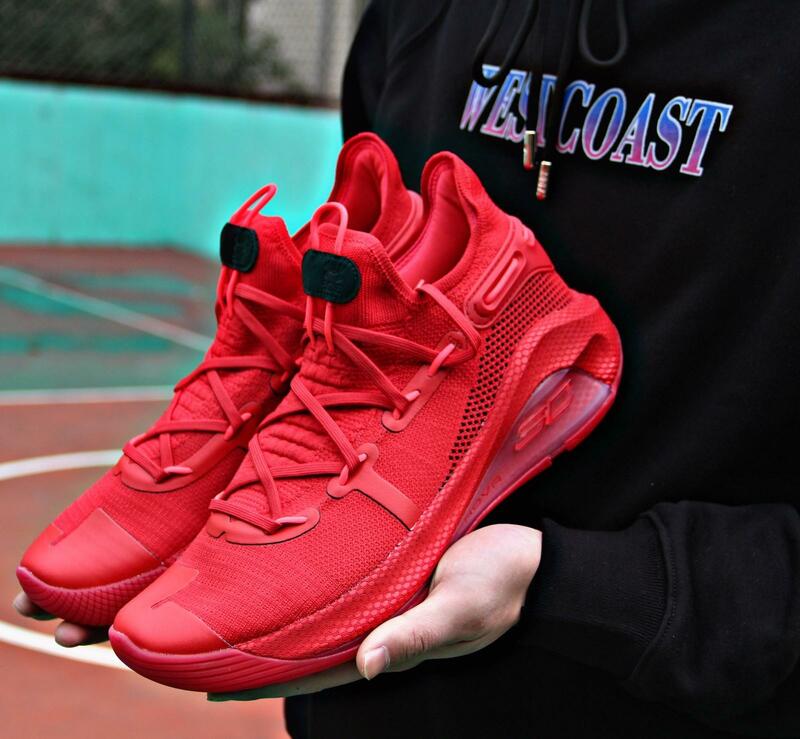 Yet, maybe your initial try-on will leave a bit to be desired, but you can’t rely on a try-on to determine how a shoe will feel once they’ve been properly worn on-court for a handful of hours. 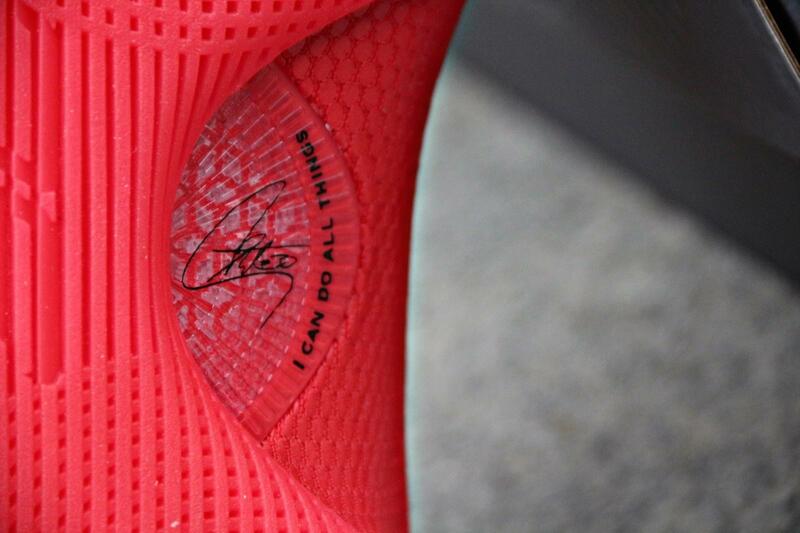 For the support: As you can see in the pictures, flex grooves are carved into the outsole to promote natural motion. 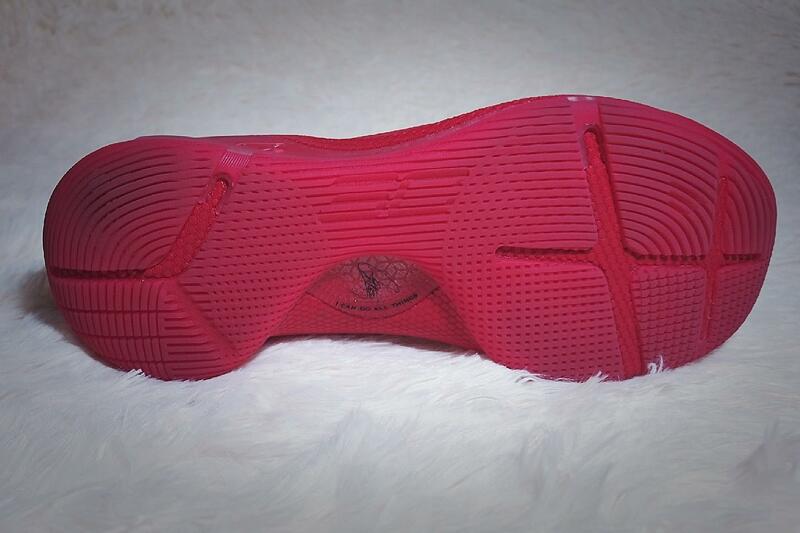 Besides, the base of the shoe is flat and wide, which is beneficial to increasing the stability. 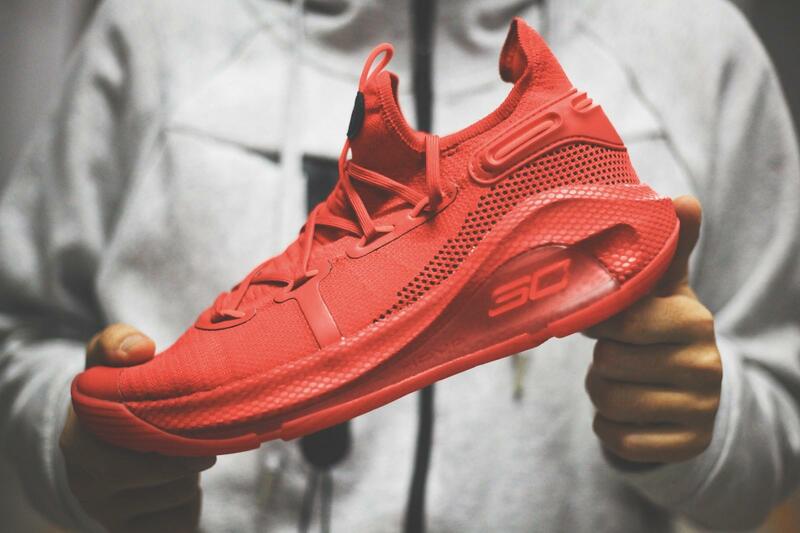 As is known to all, Curry shoes are famous for their traction and support and so is Curry 6. 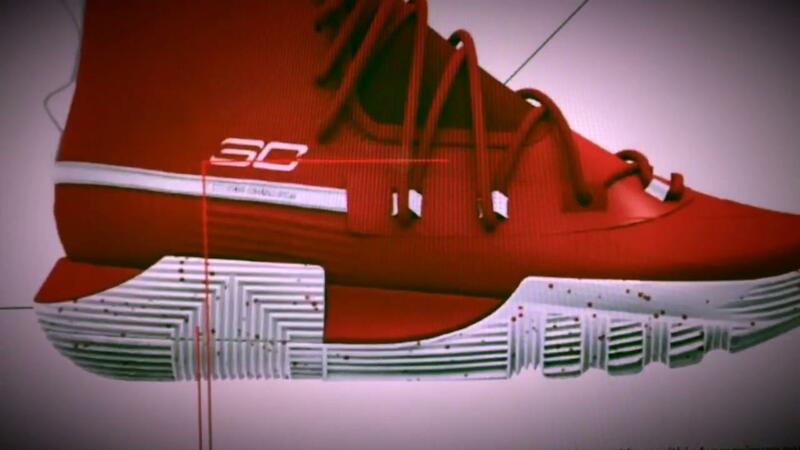 Before I’ve mentioned that Curry has equipped with Speed Plate, which greatly fortify the HOVR. 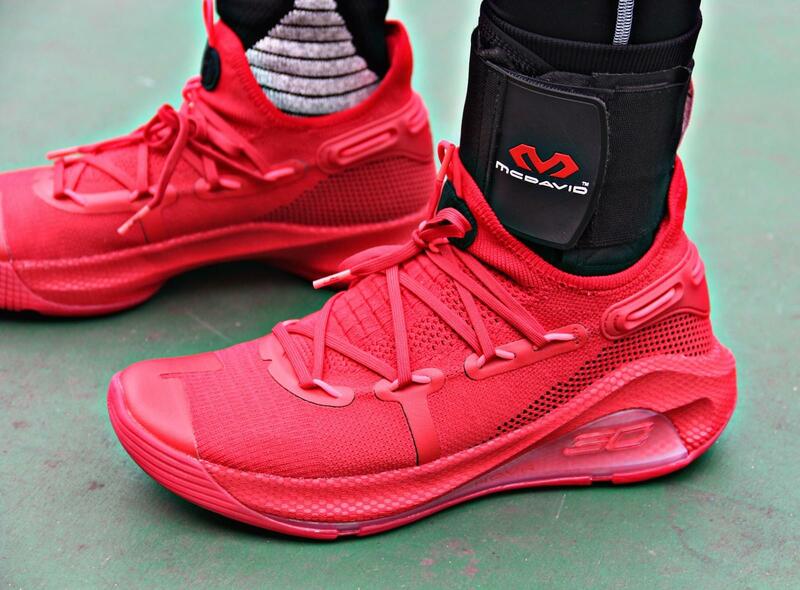 For more information, I highly recommend you play in them and experience the court feel yourself. 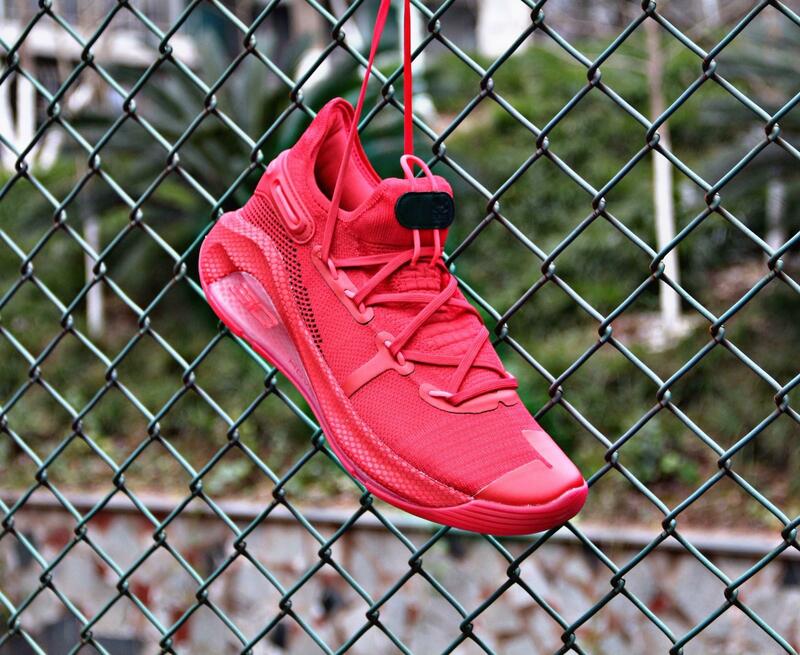 For its durability : When it comes to the durability, Curry 6 performs passably outdoors but in complex environment, there may be some material loss. 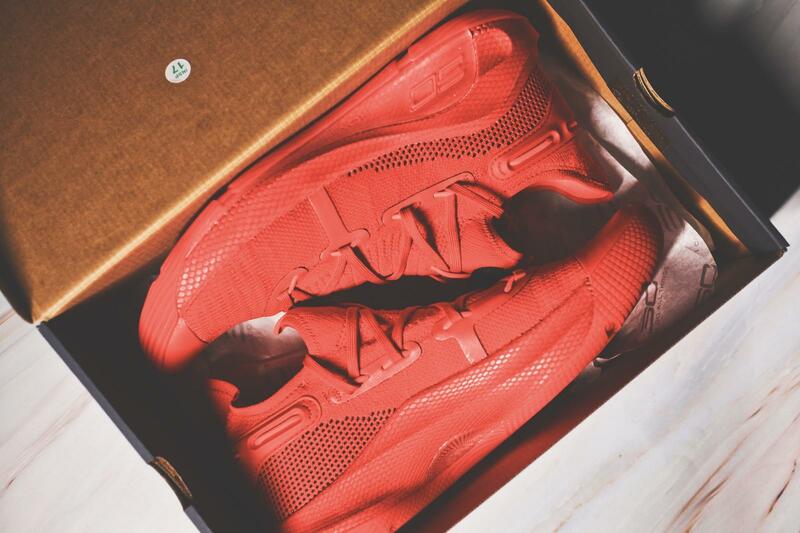 Overall: Great was my joy that I could get such a pair of fantastic shoes. 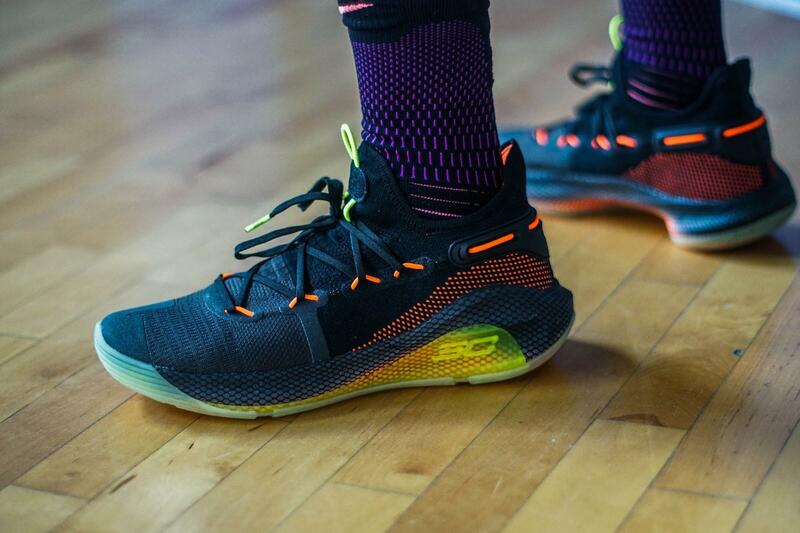 Everything about Curry 6 fascinates me a lot. 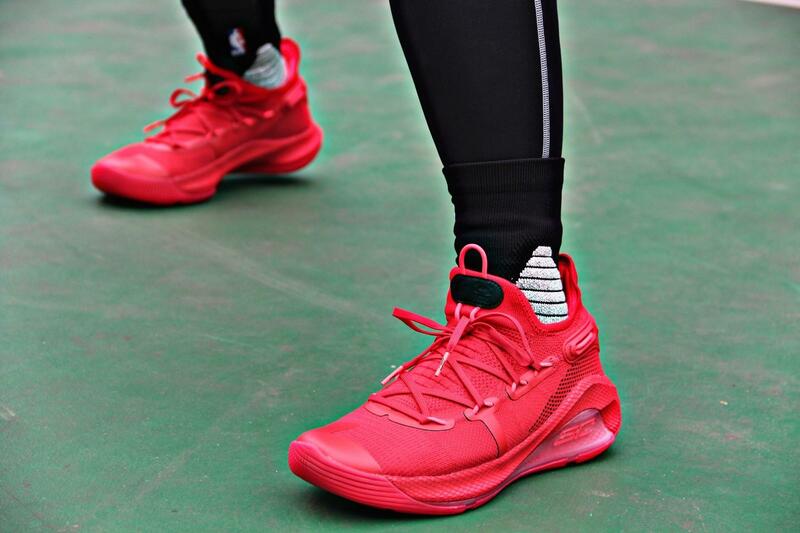 I like the court feel it brings to me; I enjoy the bouncy foot feel in court; I am totally into this bright red, which symbolizes happiness and a new start of a year. On a personal level, it is the best Curry has made. 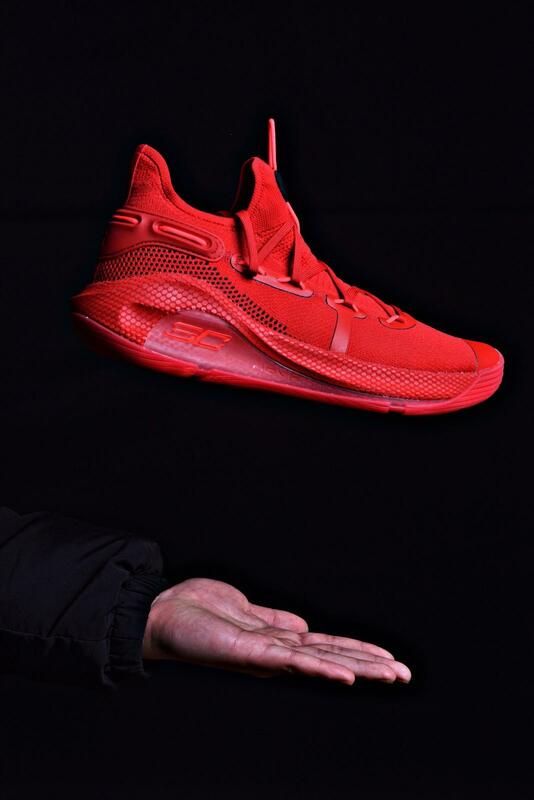 Curry 6 is just within your reach. For me, I think I’ve totally fallen in love with it. Have you? 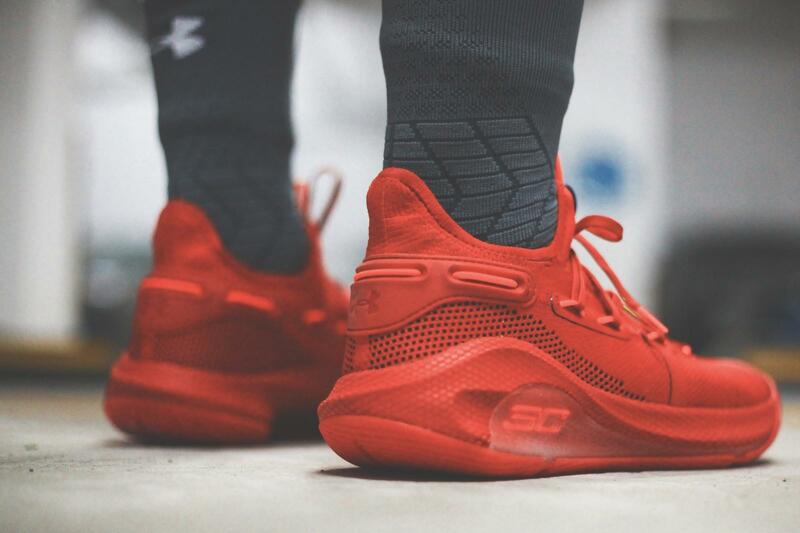 Can’t stop, won’t stop, the Curry 6 pulls from Steph’s marathon a month mileage on the court and his can’t be contained change of direction speed. 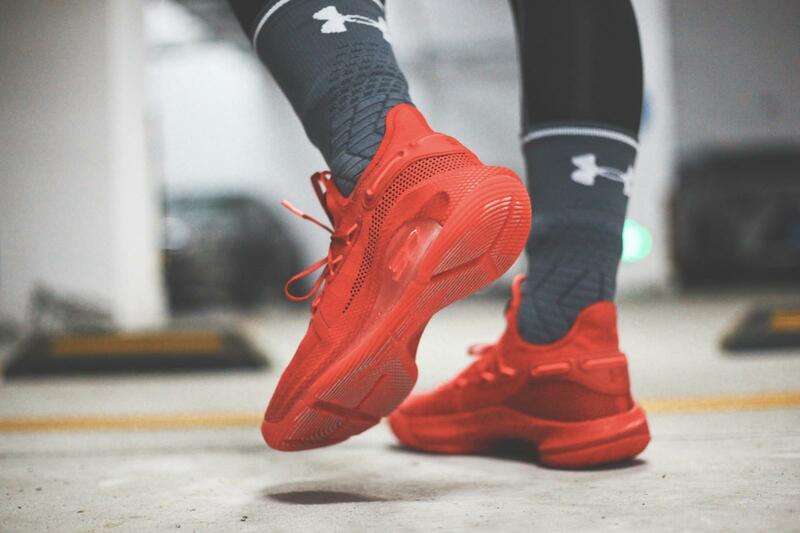 As the Under Armour Curry 6 released .Ranking in the 95th percentile for average distance covered per game, Curry’s on the move game is all about endurance and change of direction. 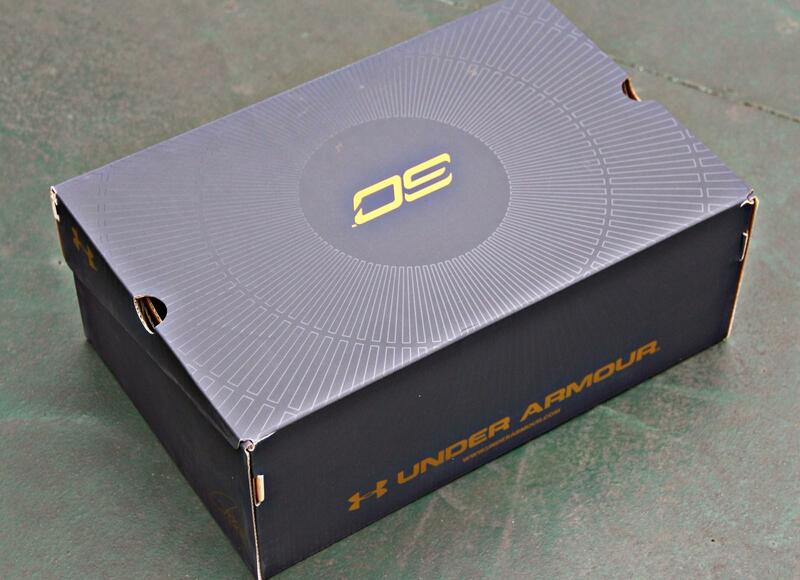 This isn’t lost on Steph nor his new shoes.all of fans was attract by the newest one , I bought the one too last week . 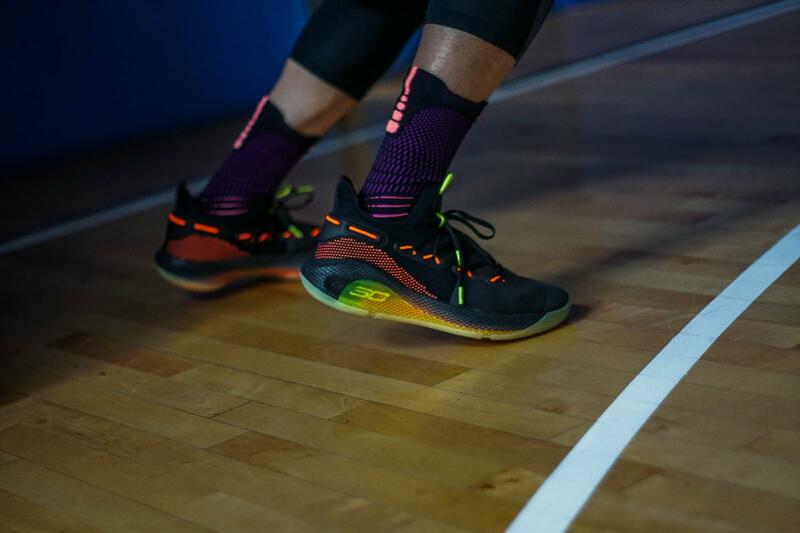 So what is the newest of the Curry 6 bring to us ? 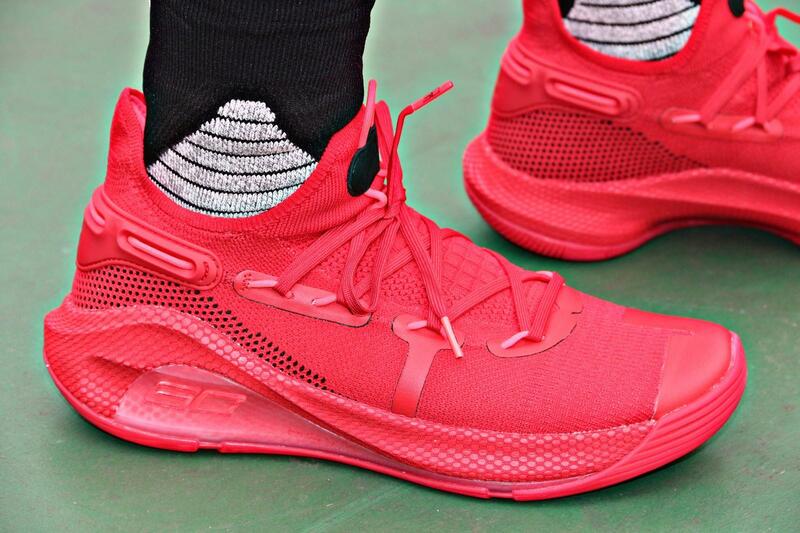 and whats different of the Curry 5 ? 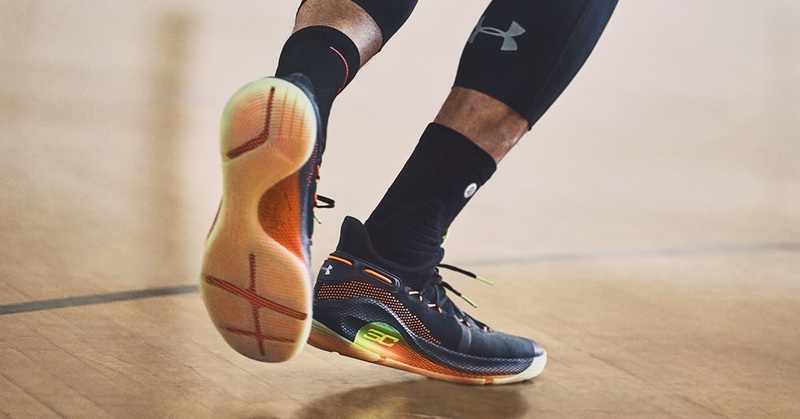 HOVR cushion is used full length in the Curry 6 and feels like a great blend of court feel and cushion ,unlike the running version that is pure cushioned under-foot goodness. 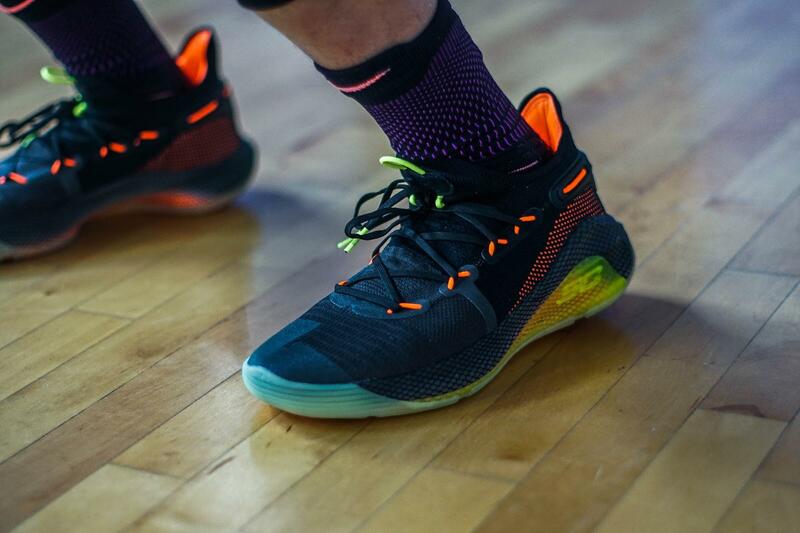 The built is knit while the traction was extremely tacky which it will be more still, but that was on the Warriors practice court so take that with a grain of salt until I can play in them on my usual courts. 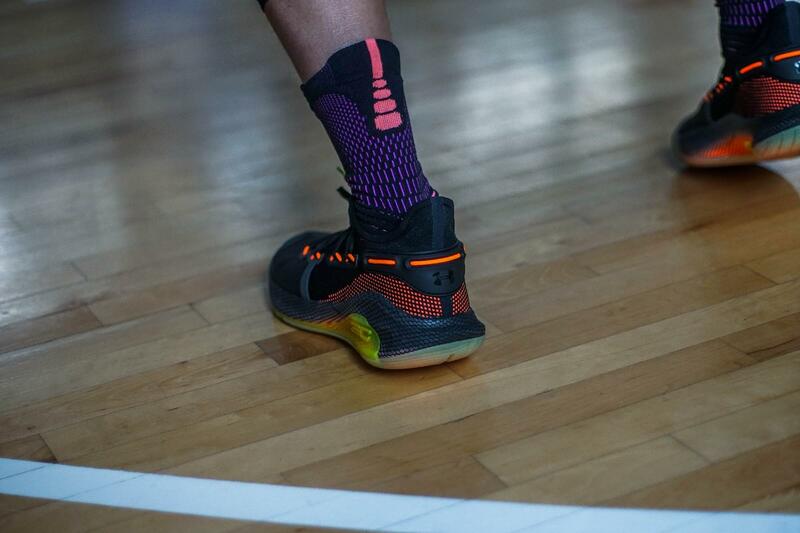 For the traction: There is no word yet on how UA will balance the bounce HOVR offers with the court feel Curry needs. 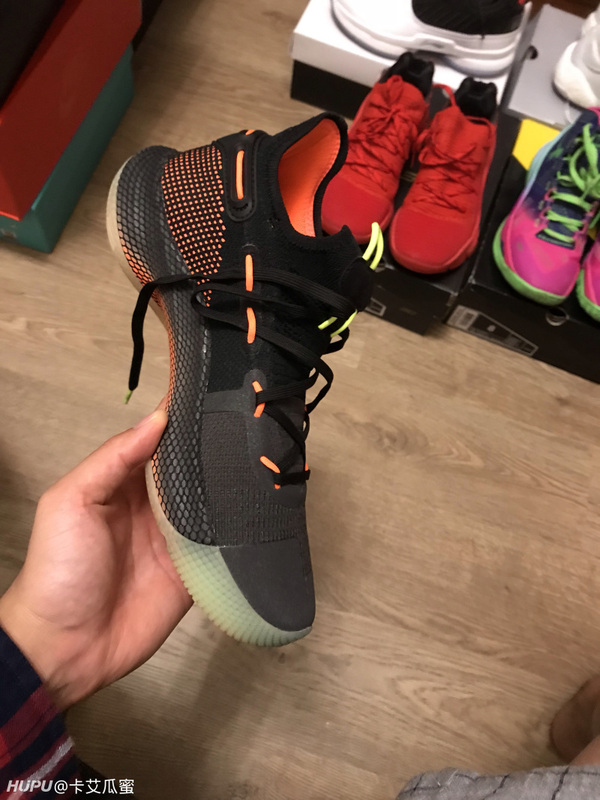 The shoe also appears to be built atop tooling similar to what was used in the Curry 5, although the lacing system this shoe uses looks new. 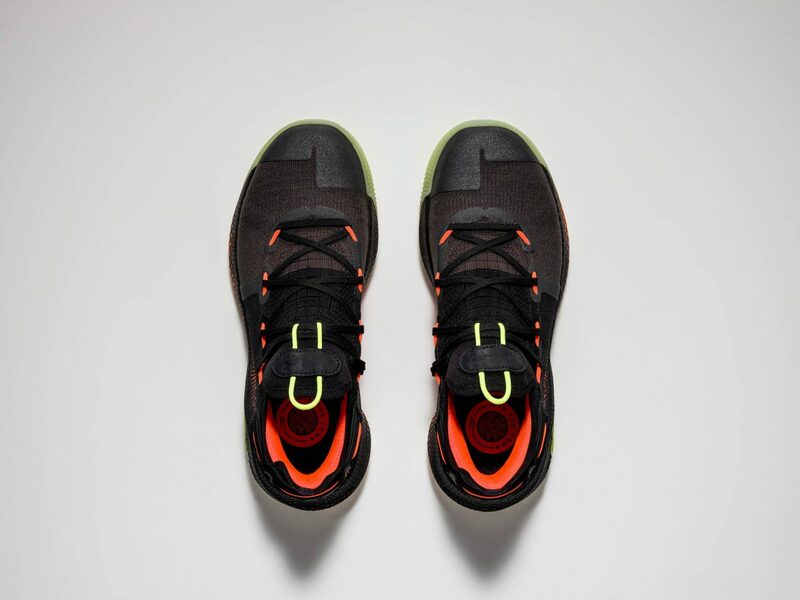 For the material , A black knit upper with tonal welded overlays is accented by vibrant hits of neon green, yellow, and orange on the tongue, eyelets, and outsole. For me, shoe also appears to be built atop tooling similar to what was used in the Curry 5, although the lacing system this shoe uses looks new.And the upper will be comfortable , I really like it . 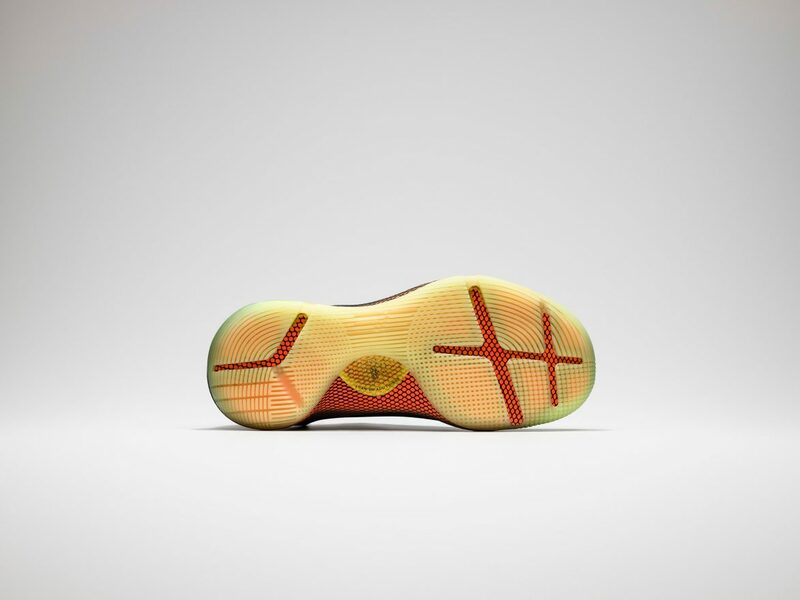 For the traction : Yellow, and orange on the tongue, eyelets, and outsole. 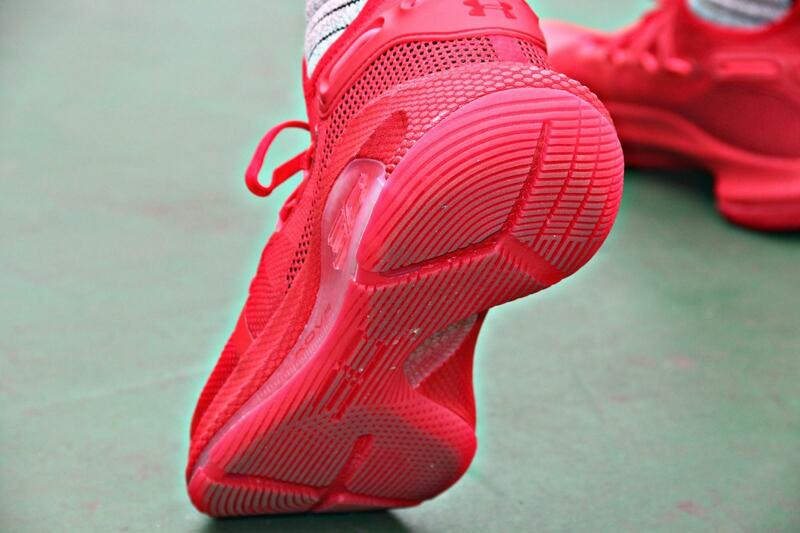 The traction actually really great , Herringbone is missing from the Curry line for the very first time, and while we love our herringbone,the grip also nice ,you can play in the clean court ,that is will be help in the game , but if you play outside ,that will be worn of the traction .The commercial is very exciting and hypes the program as a way to improve your game by learning insights from one of the best players in the game. 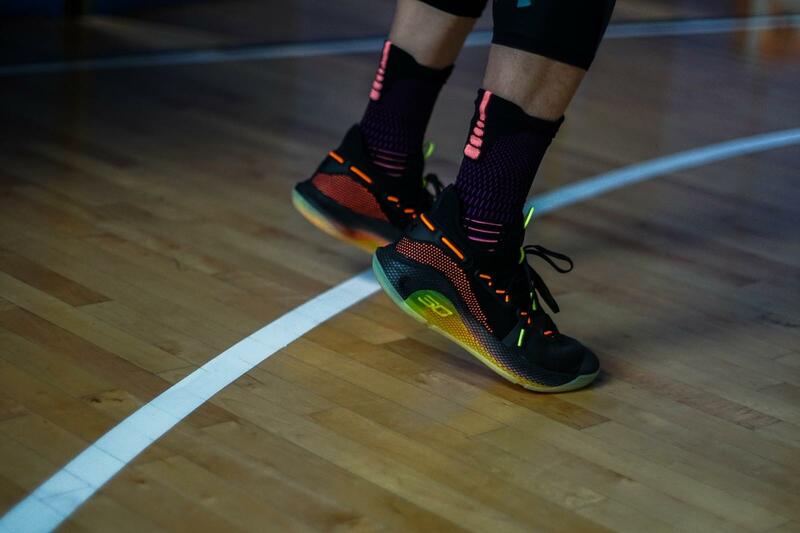 Compare with the Curry 4, The spiral pattern put in place offers multi-directional coverage for any move performed at any time. Linear coverage is fantastic and lateral coverage is handled very well too.When dust is present the tackiness of the rubber compound used attracts dust like a magnet. 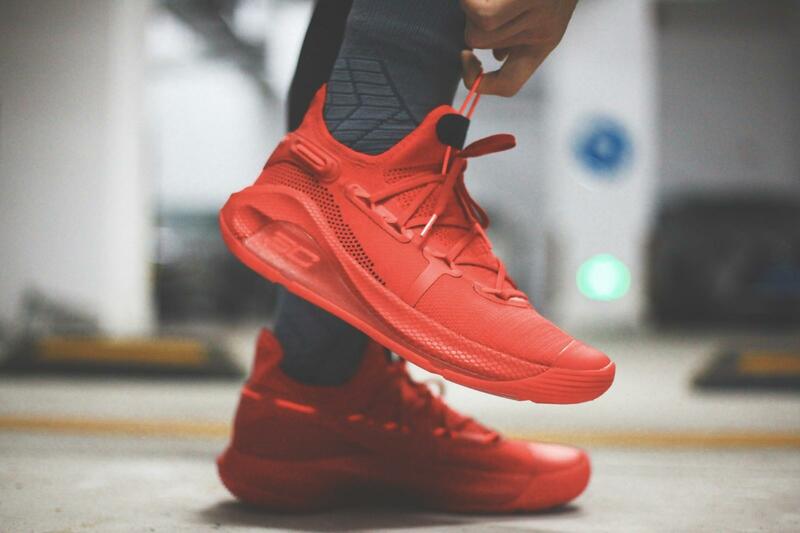 But all of performance is really great .I think the traction of Curry 4 is great too . 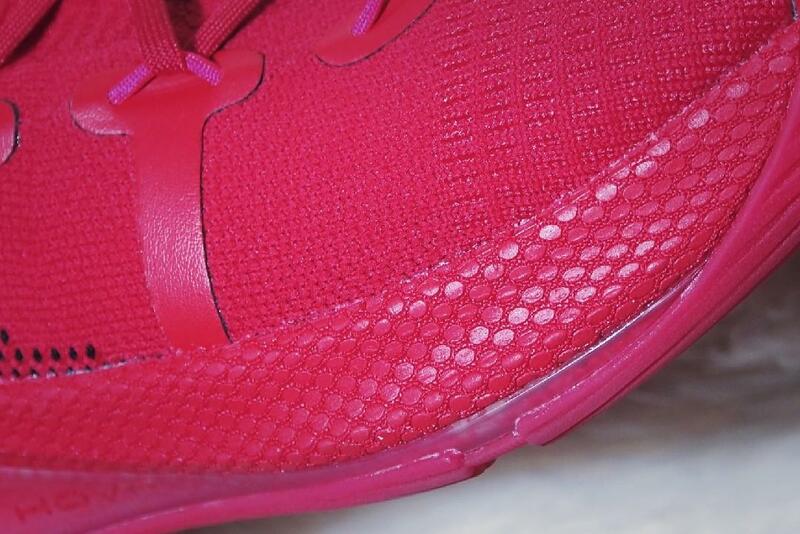 The shoe also appears to be built atop tooling similar to what was used in the Curry 5, although the lacing system this shoe uses looks new. 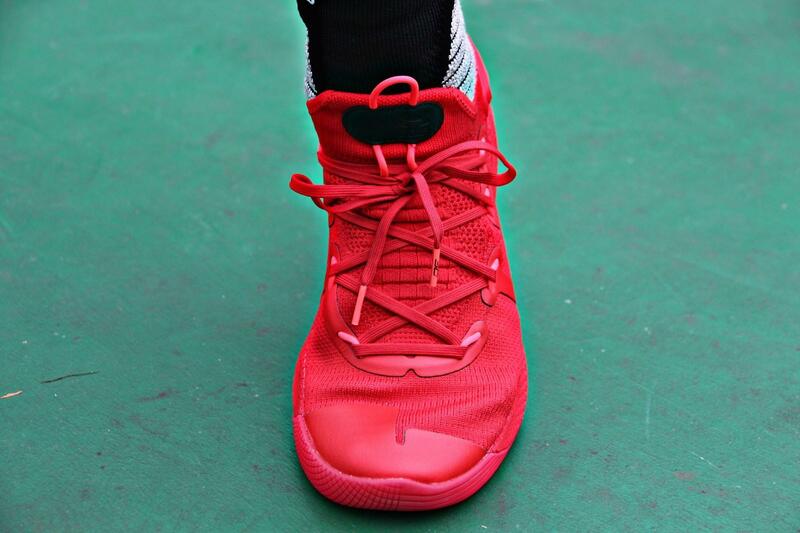 An unique eyelet system that wraps around the heel, a sock-like ankle collar, and elastic pull tab on each tongue. 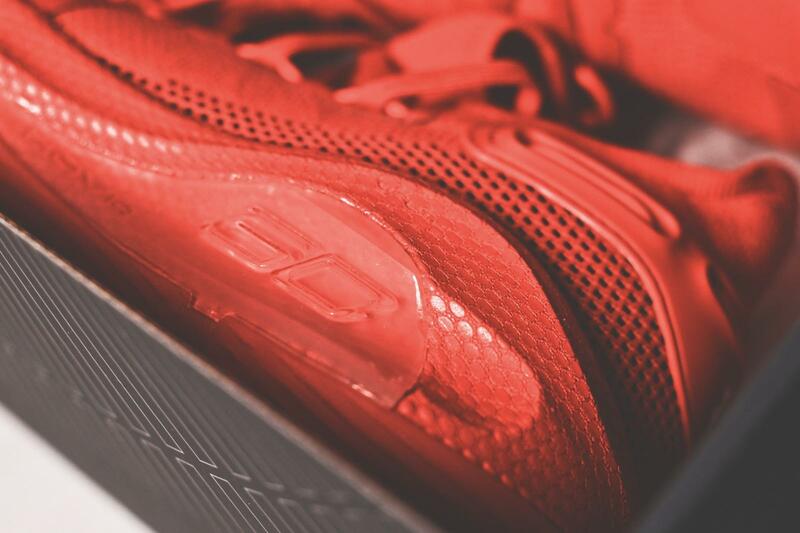 Full-length HOVR cushioning has been added to the midsole for improved impact absorption and energy return. 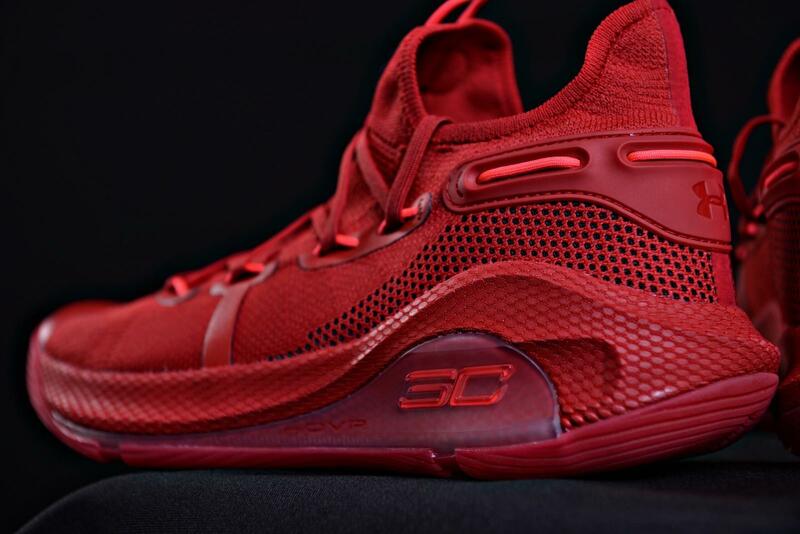 A split outsole design aims to provide Curry with superior traction for his fast-paced movements. 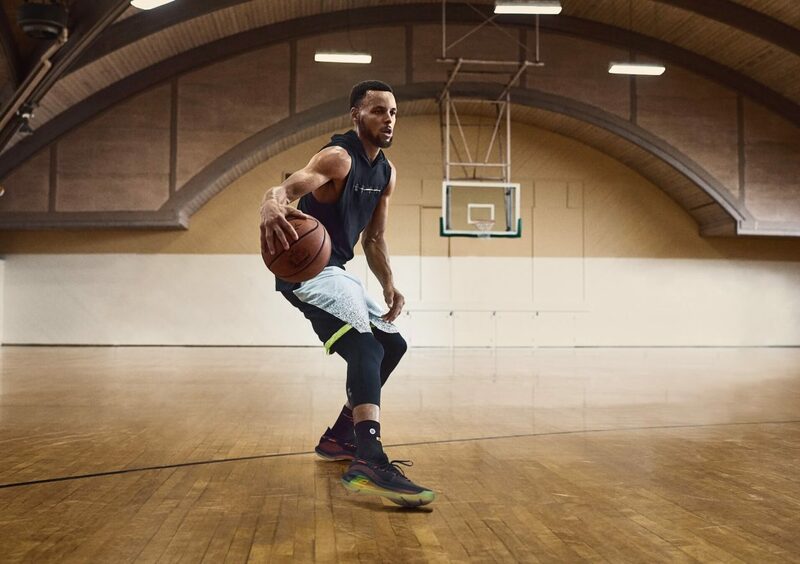 When I heard about the Steph Curry Masterclass Basketball Training Program I was excited to learn more. I’ve always respected his ability to outthink defenders and use skill to beat athleticism. 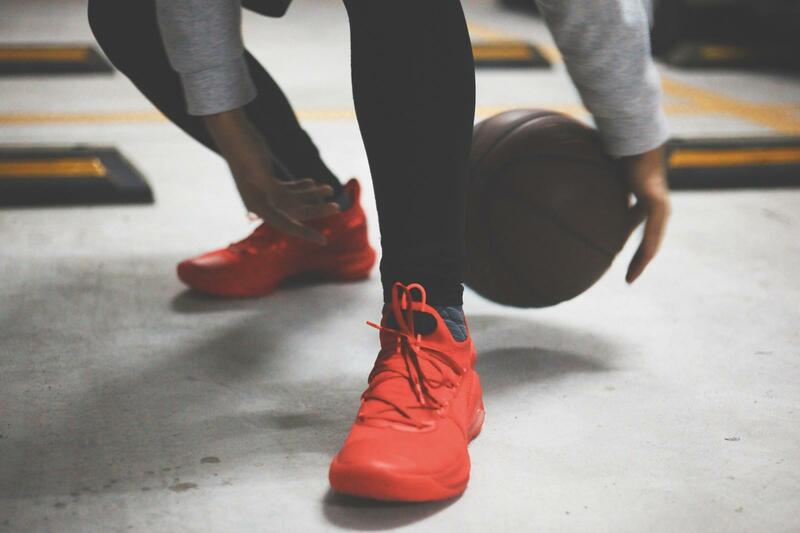 But I worried that the program would be short on fundamentals and instead be spending the majority of time teaching students how to do crazy one on one moves, which most players can’t execute well. 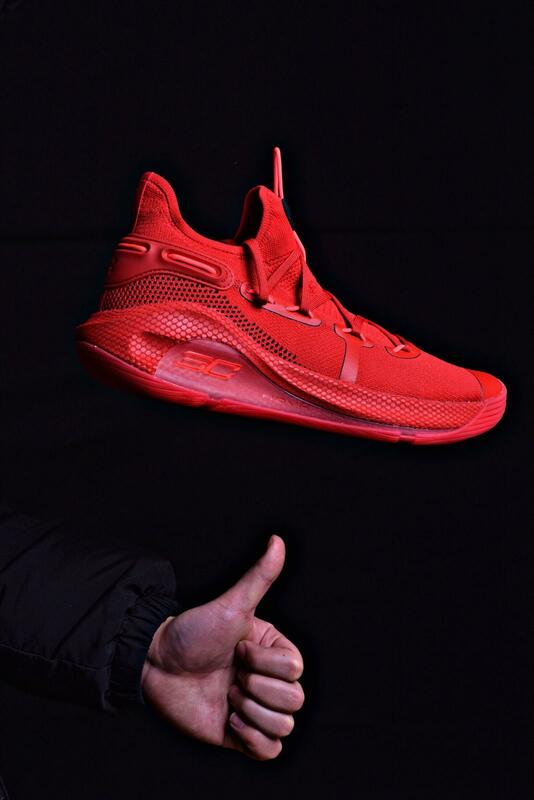 So the cushioning really help a lot anyway .Curry loves court feel — enough to sacrifice cushioning for it — so there is no word yet on how UA will balance the bounce HOVR offers with the court feel Curry needs. 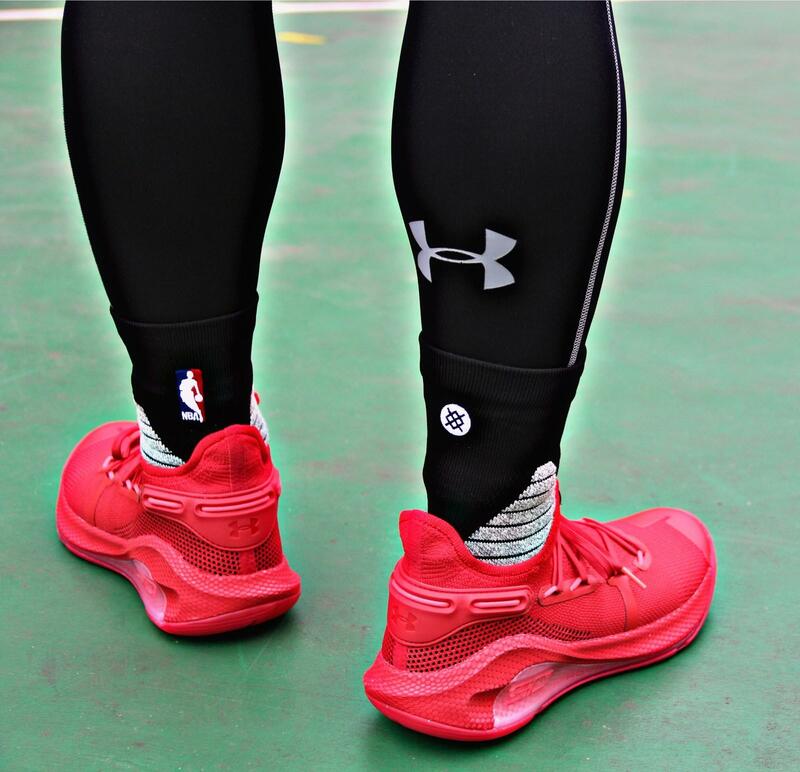 Overall, the Curry 6 already upgrade a lot ,but also Curry 6 was followed the Curry 4, 5, it is a nice material and good look ,everything is great. How about your idea ? please let us know below the comment .